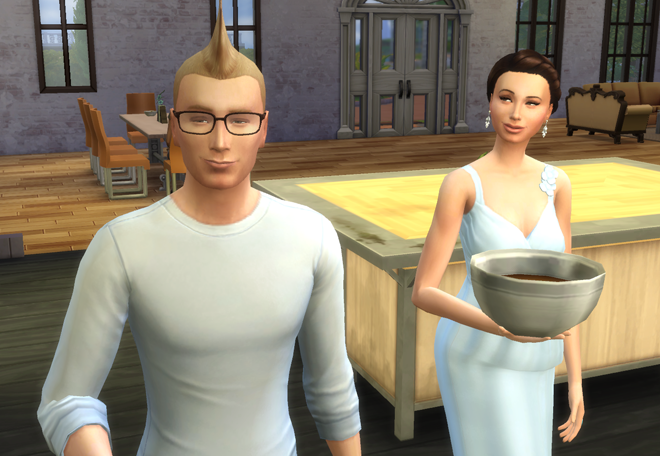 The next morning, while Malcolm and the kids were still asleep, there was another knock at the door. It was freakishly early and Edelweiss was weary of this business already, but she reminded herself it was for the greater good and answered. Sort of. “It’s not locked – go ahead and let yourself in!” shouted Ede without thinking. Plum, Ede – you’re going to wake everyone up. The young woman stepped inside and looked around. Not seeing anyone, she called out. Still nothing. 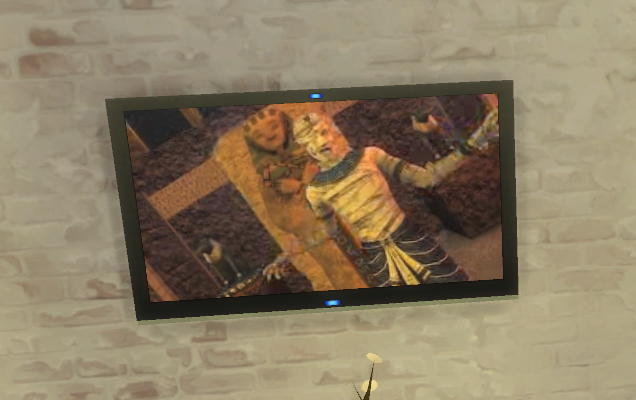 This was getting kinda creepy. This is the part where the door slams behind me and all the lights go out, right? The young woman was nervous, but there was an underlying confidence there that Ede picked up on. She could relate to that. She warmed up a bit. In person? What the plum is this kid talking about? I didn’t put my picture on the flyer, Ede thought. 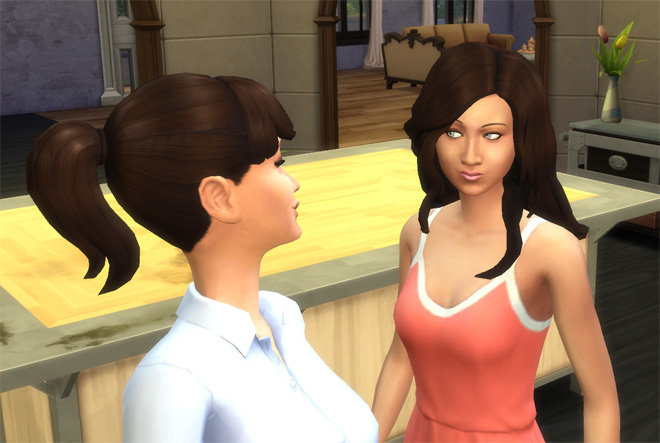 Ede gave her a curious look, but decided she didn’t need to know what that was about right now. “Have you come far?” Ede asked. Why’s this lady looking at me like I’m crazy? 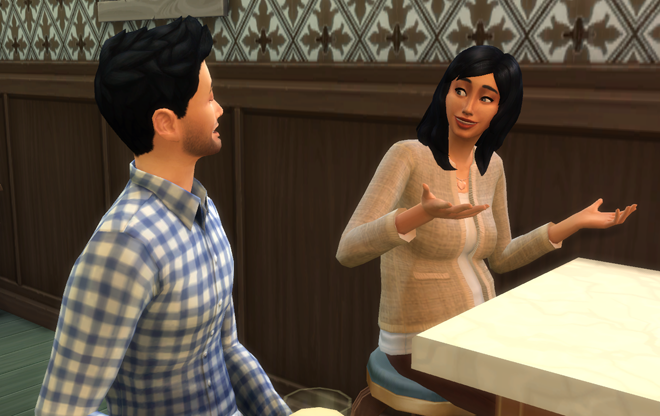 Edelweiss got started on breakfast, and used the time to get to know Brianna a little bit. “Being the heir isn’t that big of a deal,” Ede said. 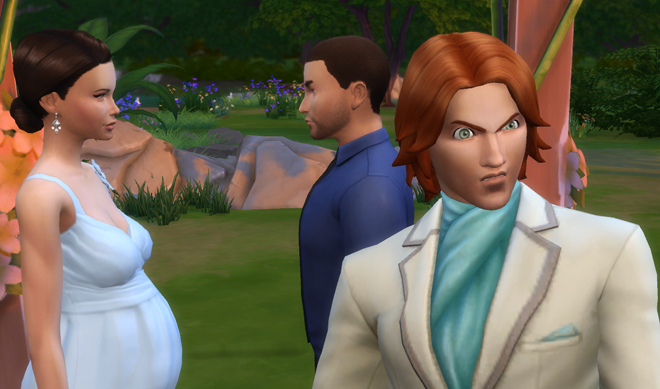 “Says the heir!” Brianna laughed harshly. Comments like that really ticked her off! 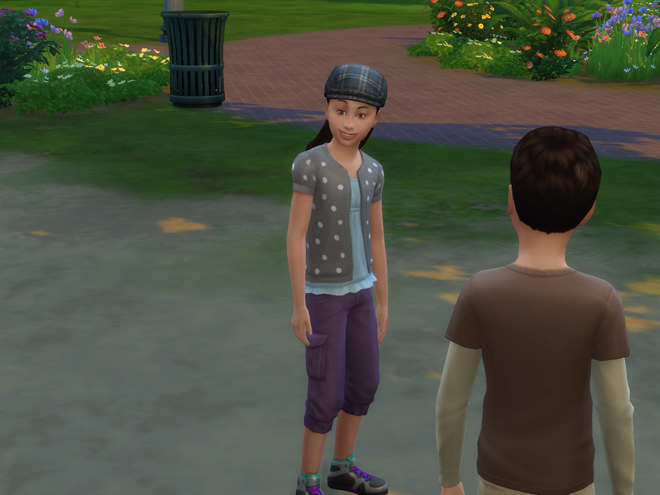 Dang, this kid was pretty bold considering they’d just met. 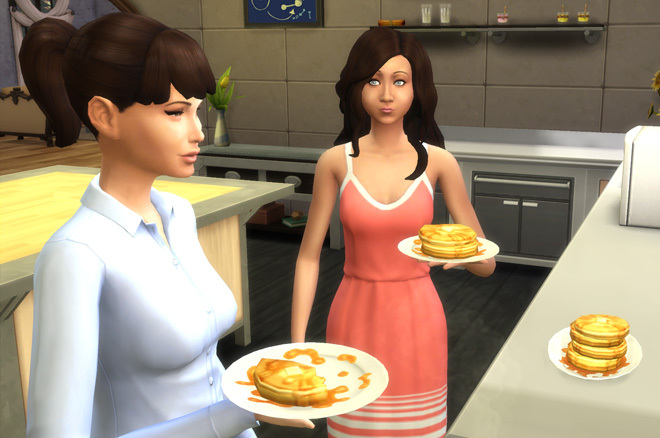 Ede smirked involuntarily and focused on the pancakes. 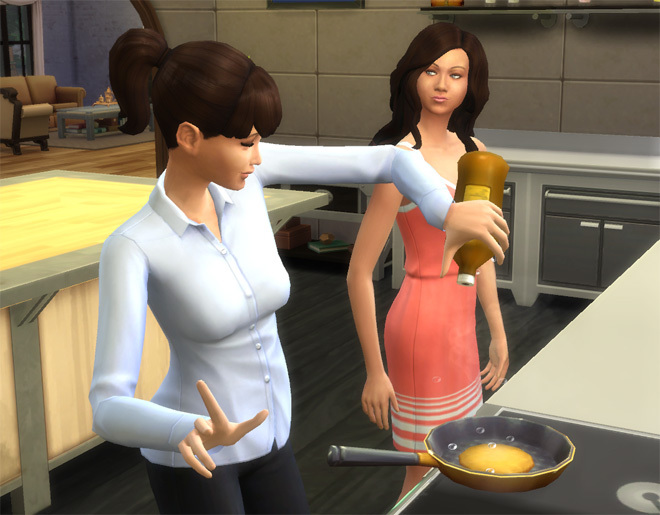 She gently slid the spatula under the one she was working on, and flipped it, way harder than necessary. Brianna eyed it hungrily as it rose into the air, arced and smacked into the kitchen window. Ede silently poured another pancake and repeated the process. This one just missed the ceiling before landing over next to the sink. “Almost finished!” Ede said with exaggerated cheer. Ede stacked a nice high pile of pancakes on the platter. 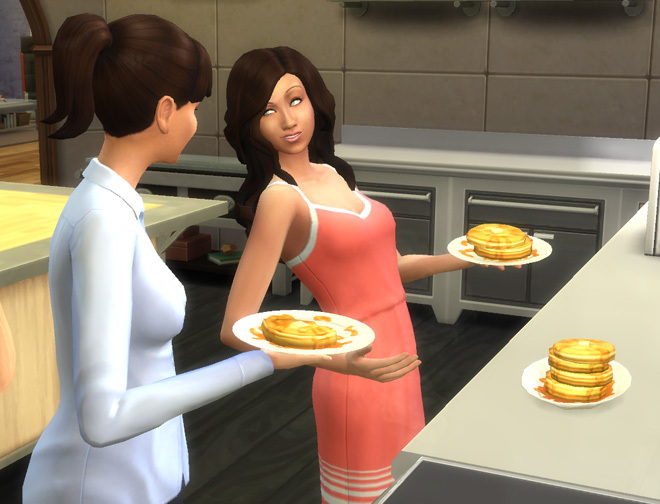 She could almost hear Brianna’s stomach growling. Brianna hadn’t uttered another peep, though. 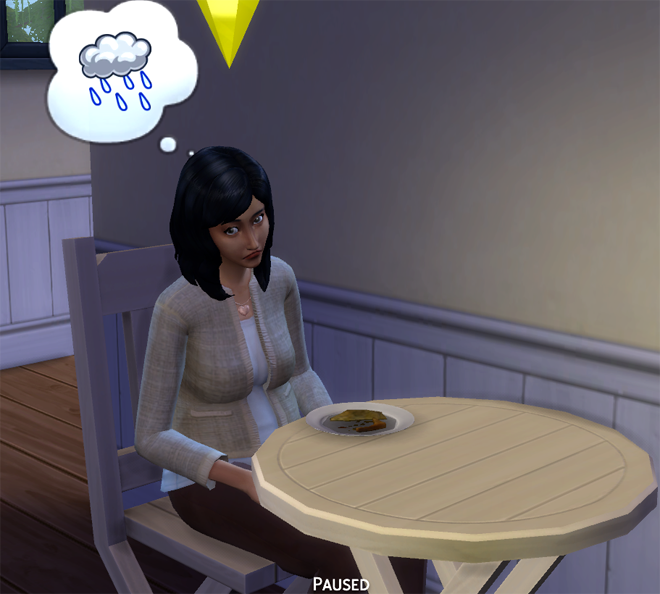 Ede grabbed herself a plate and took a bite. 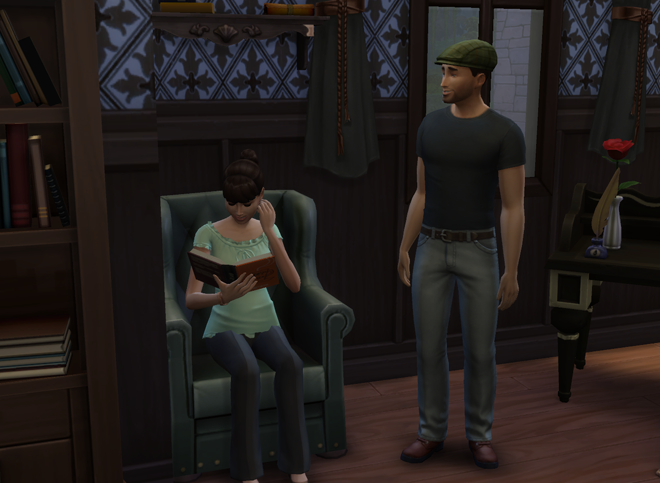 Brianna just stared with a sad, grumbling sort of confusion. 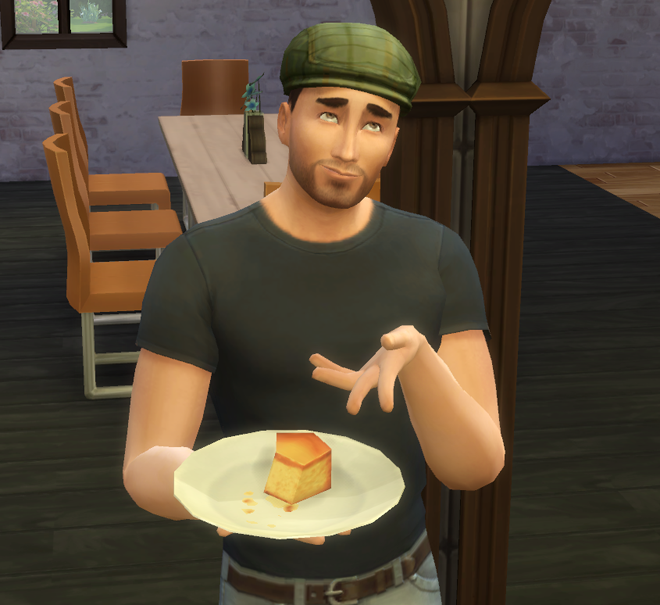 “Oh, did you want some?” Ede asked with mock innocence. “Now you’re just plumming with me,” Brianna scowled. 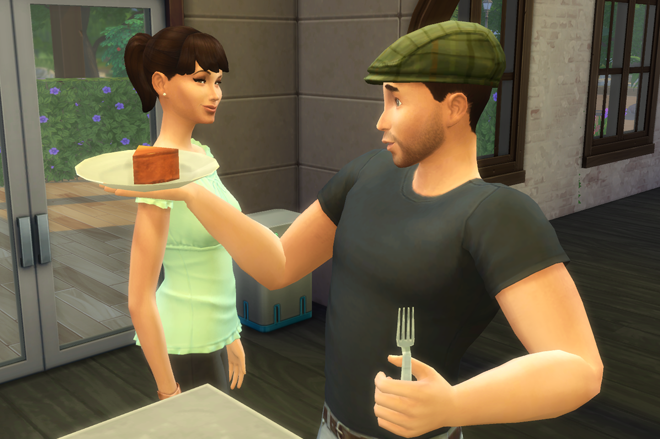 Ede grinned and dished her spirited young guest up a plate. 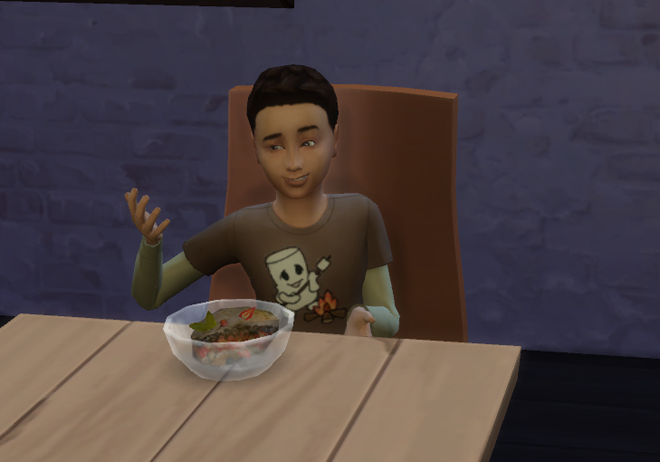 Okay, Ede liked this kid. Apology accepted, Brianna thought, but wouldn’t admit. She couldn’t contain a food compliment, though. 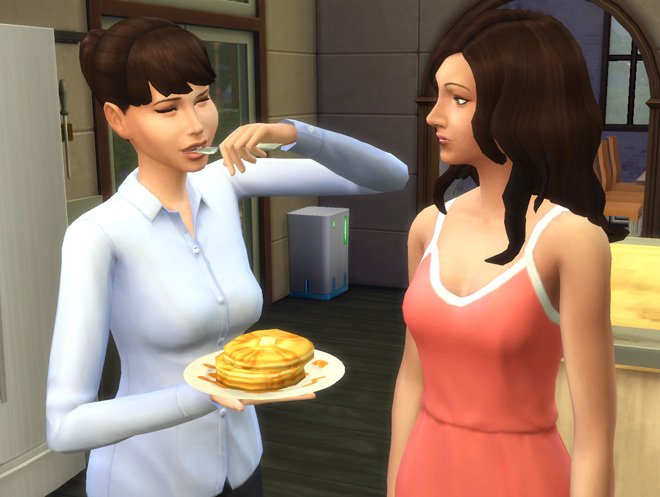 “These pancakes rock!” Brianna said as she stuffed her face. Like Ede, she was bone thin no matter how much she ate. She probably had some kind of propensity for physical activity too. Brianna hadn’t known this about the Wolffs before, but learning so now had her feeling confident that she’d made the right decision in coming here. Plus, Edelweiss was kinda cool, for an heir. 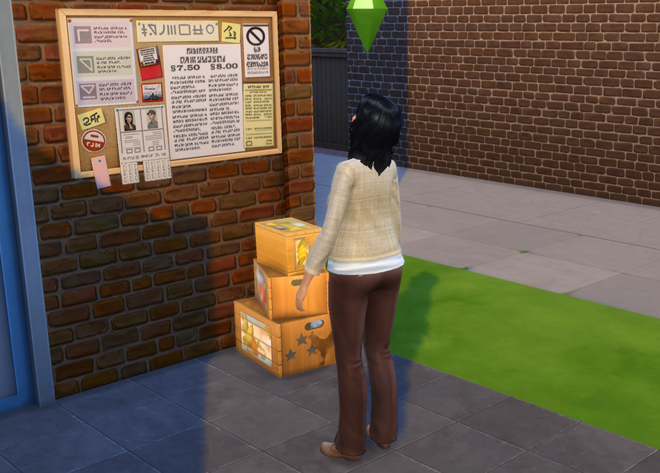 Reagan Sloan had already been in town for days when she came across the Wolffs’ “Settlers Wanted” recruitment flyer. Reagan came from a place not entirely unlike the one she’d immigrated to, but with one significant difference: where she was from, nearly everyone was Game-Aware. They knew they weren’t “real” people, but digital representations of people made up of zeros and ones, and they somehow understood the mechanics of their game-universe well enough to manipulate them. Back home, she’d lived mostly in the background, occasionally mistaken for someone important. Here, the local versions of everyone she’d known were long dead. “More than dead — dead and culled,” Reagan thought aloud. 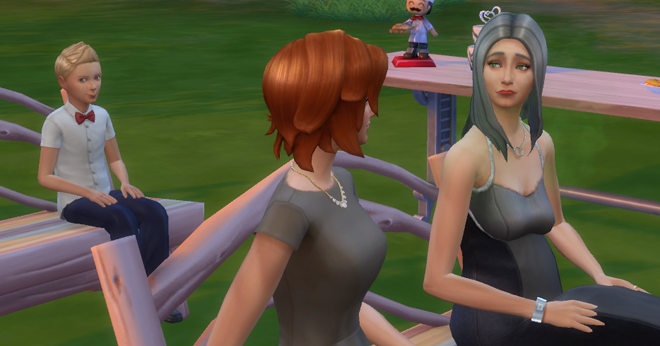 The Goth mansion, where she’d served as a maid not long ago, stood empty; their proud bloodline faded to dust just beyond reach of the typical single-minded focus of a Legacy Player. And Oakenstead, the lot that once held the sprawling estate of the wealthy, oft-misunderstood Landgraab family, now bore the somewhat-less-sprawling estate of the 5th generation legacy family whose save game she’d willingly relocated to — the founder of which had bulldozed the Landgraab’s occupied house to the ground in her first few hours of existence. “Just can’t catch a break, can you Geoffrey?” she smiled, recalling the awkwardness of her former acquaintance. Why the melancholy, and why hadn’t she introduced herself to her hosts? Reagan wasn’t Gloomy. She wasn’t a Snob, or a Loner. She hadn’t planned it to play out this way — she certainly didn’t set out to be secretive — but ever since arriving here Reagan had felt like keeping a low profile. 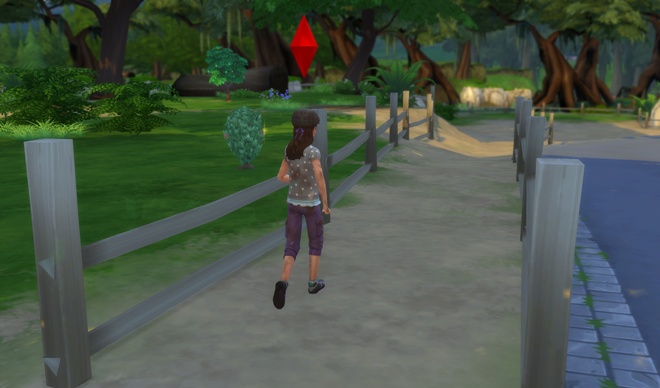 She hadn’t come across a single overtly Game-Aware sim here yet. While it might sound creepy, being somewhere where folks went about their days without realizing the true limitations of their own existence, Reagan discovered that she actually liked it. She found that she could relax and enjoy being in a place where the average person wasn’t obsessed with subverting their own mortality or concerned with conspiracy webs and epic wars between good and evil. 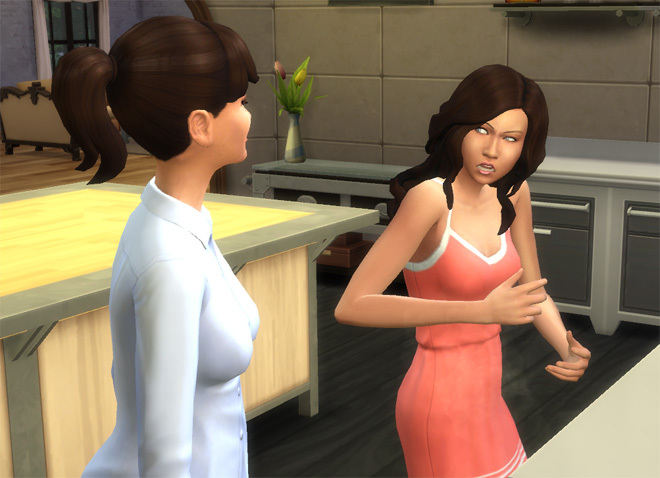 Was it wrong to just want to be a regular old ignorant person-sim? You know, live a life. Die a death. Start a family somewhere in between, maybe, if she was lucky. Let someone else worry about the world beyond the world, for a change. Reagan was doing pretty well for herself here, besides. Got herself a cute little house. 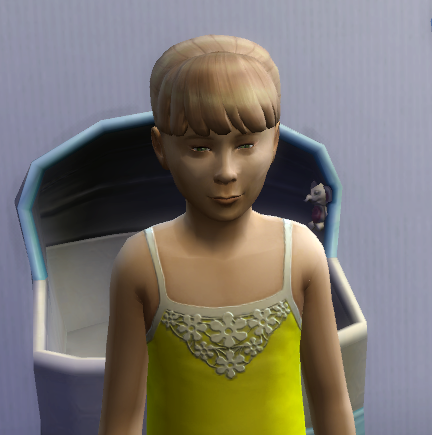 Made headway on her Collector aspiration. Went on a few dates. 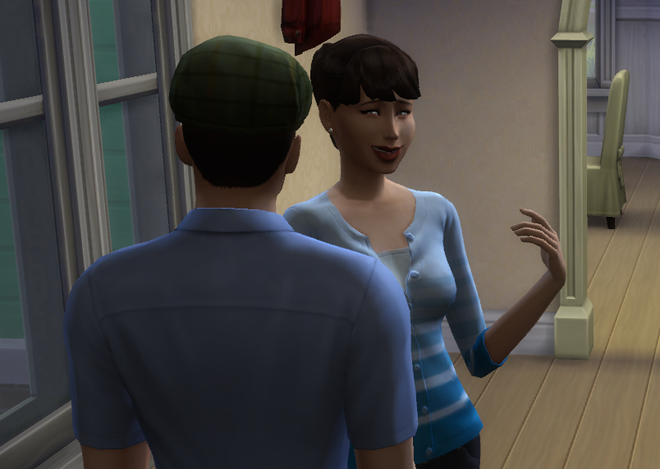 Even found a quirky live-in boyfriend who was tolerable enough, and seemed perfectly willing to help with her other goals. It’s refreshing to be with someone as clumsy as I am. The li’l ferret-face really is a great kisser, too. And I have no complaints whatsoever here. The Wolffs did seem like decent folks, though. 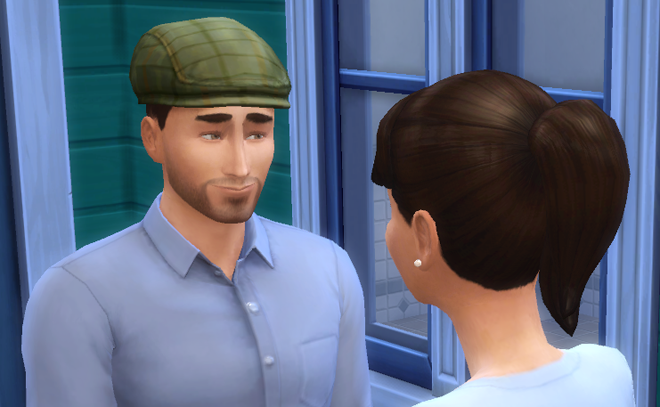 She’d already met Malcolm by accident, and he appeared to be as genuinely kind in “person” as he was in the blog. 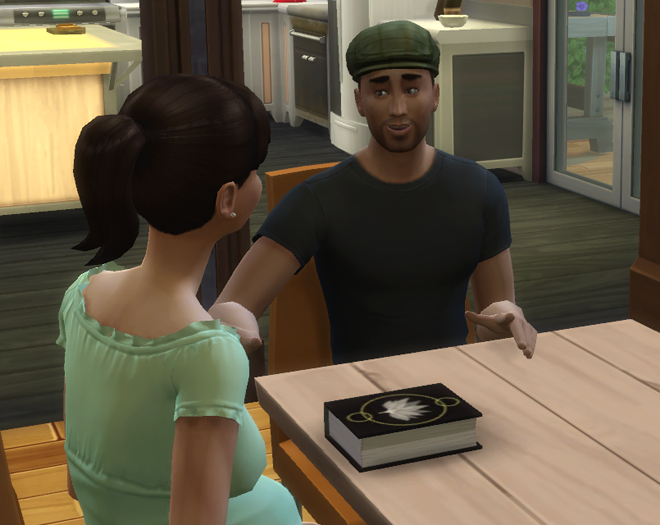 Of course, she didn’t tell him anything about her origin or the metaphysics of the Simverse. 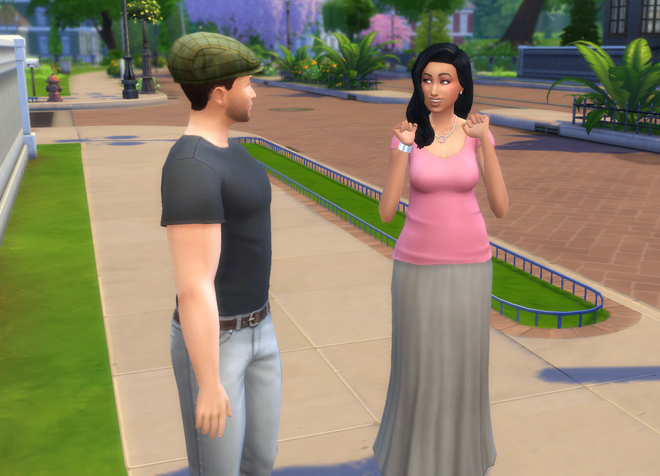 As far as he knew she was just another local townie who may or may not still be here in the morning. She’d come clean to them eventually. I think I’ll just stay in Eden a wee bit longer, if that’s okay. The Skinners, on the other hand, weren’t at all shy about announcing their presence. 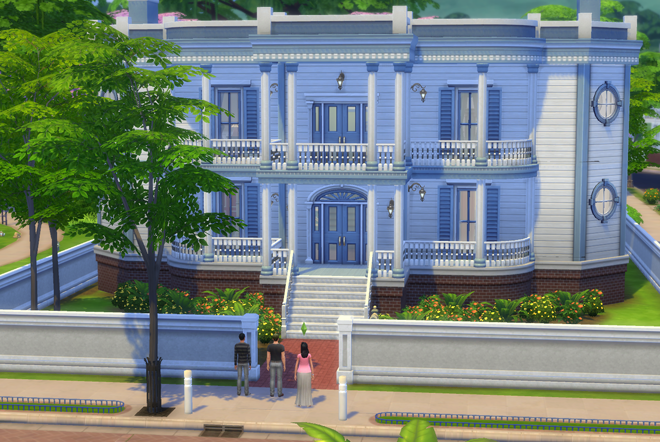 The Wolff estate was their first stop the moment they left the Gallery. The woman who entered was a knockout. 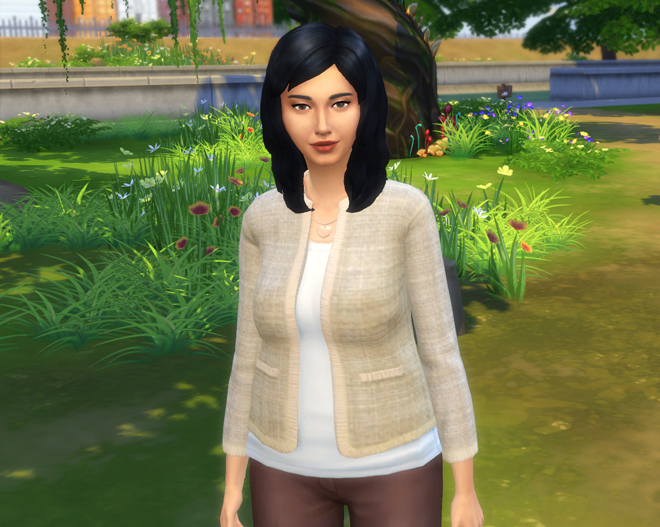 She had an almost Bella-like charm about her – that disarming, stand-out kind of beauty that you can’t really recreate in CAS. 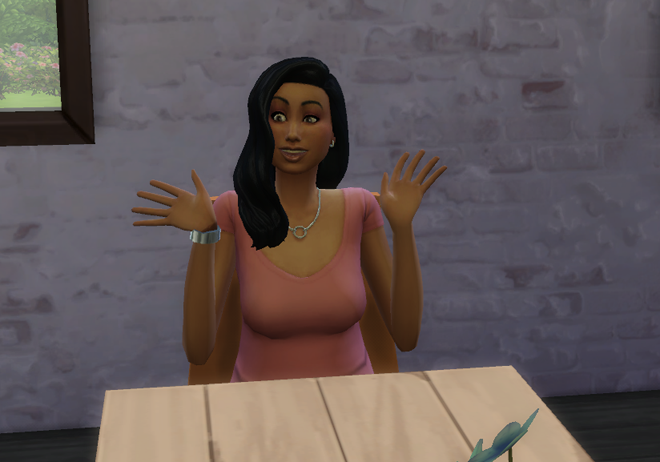 Oh look, they have an.. With a.. Oh, my..
Ravon lost her happy face midway through the greeting, when her eyes rested on the rustic, mismatched bits of our eclectic decor. 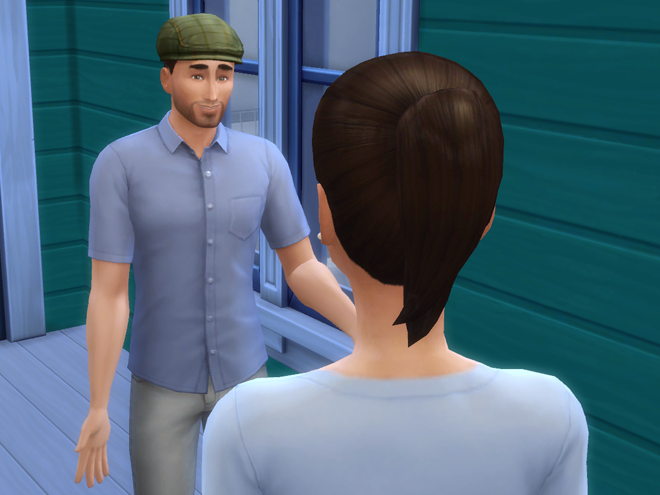 Ede gave a quick half-smile and motioned to Malcolm to take over – home visits from strangers made her a bit surly, and this one seemed like it was gonna be extra-challenging. The Skinners hailed from Skinnerville, and were offshoots of another established legacy family. 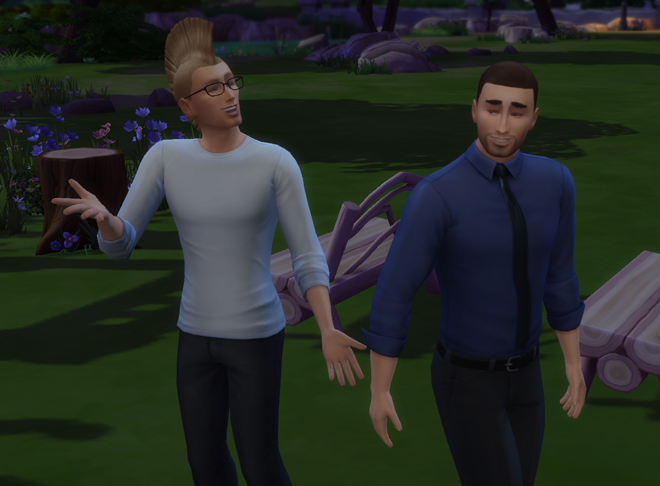 As they weren’t the heirs, they didn’t need to remain there — Ravon and Joel just wanted to settle somewhere to raise their own Big Happy Family. The Skinners were looking for housing today. 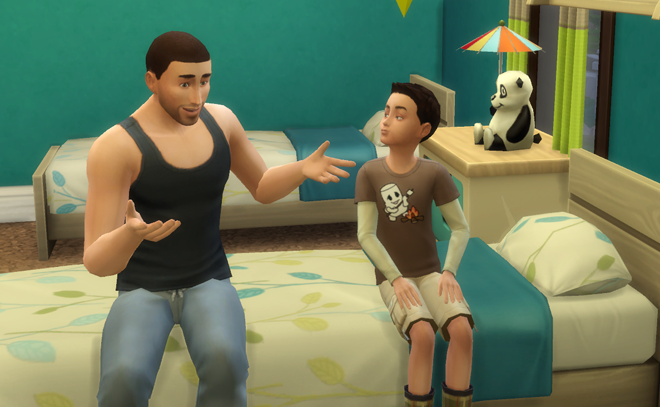 Joel described their needs to Malcolm, and summarized that he would be happy with anything that was clean and had room for his studies and their future children. Simple enough request, though. 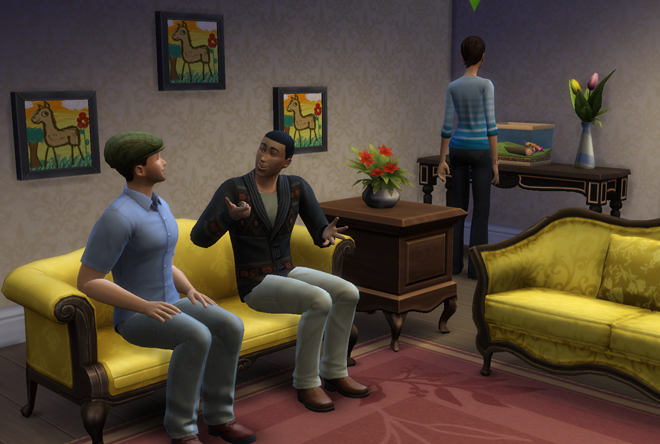 Joel seemed pretty easy-going – Malcolm could see the two of them developing a natural friendship. Ravon’s tastes, however, were a little more discerning. 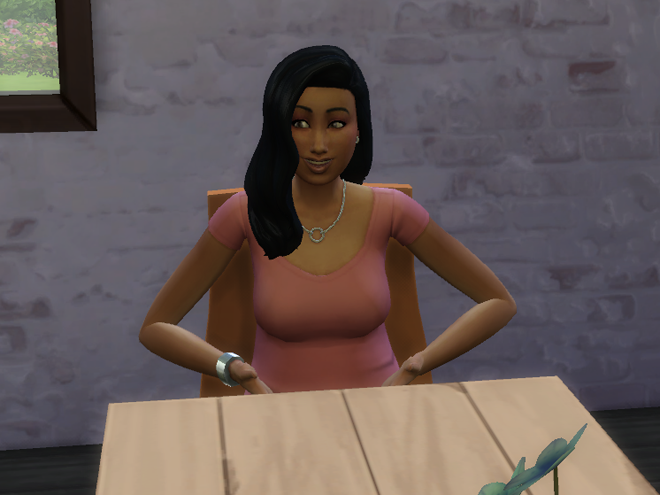 “I’m sure you can see that we’re expecting,” Ravon appealed to Cooper, likely able to sense her Family-Oriented nature. The room fell into an awkward silence. 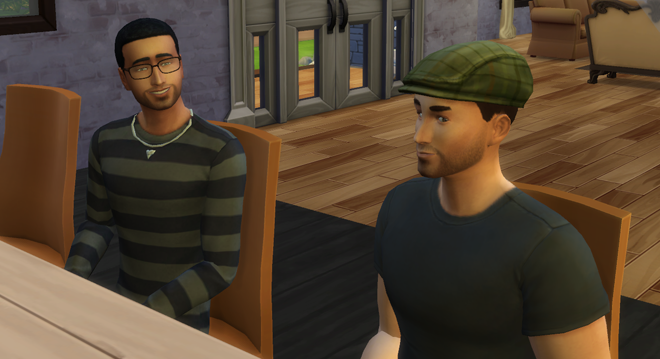 Malcolm froze as he watched Cooper’s mouth begin to twist into a familiar pre-explosive grin. “I think I know just the place!” said Malcolm quickly, before Cooper could show herself, and ushered the Skinners outside just in time. 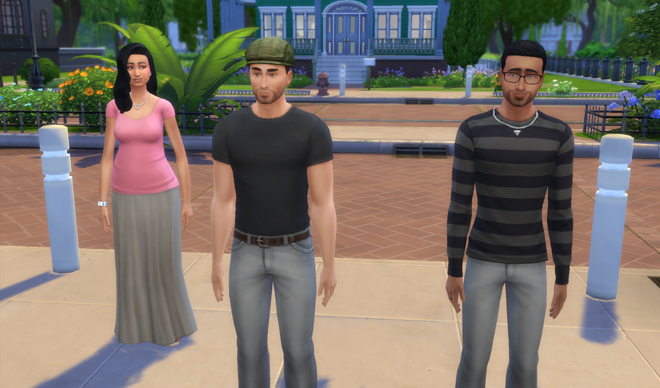 He brought Joel and Ravon to Umbrage Manor, which was pretty much the fanciest unoccupied home in the neighborhood. 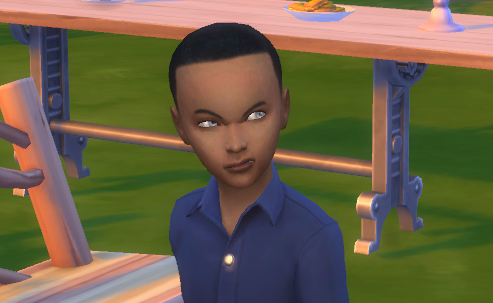 For some reason Ravon’s eyes were stuck on Malcolm. “Oh. Oh!” she squealed, finally seeing it. 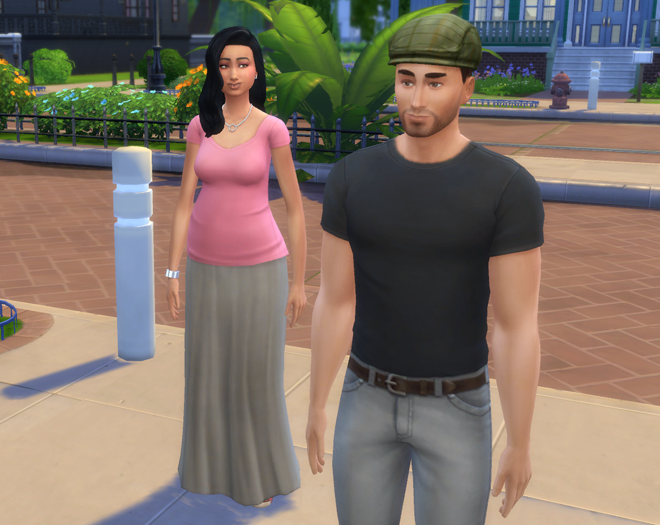 Fine, if you don’t want my attention..
Joel went inside to check the place out, while Malcolm looked for an opportunity to politely excuse himself and Ravon took a moment to lay down some guidelines for the use of her new sidewalk with her new neighbor. Jarrett, not sure how to react to this, traded “I dunno, man” glances with Malcolm and then crossed the street to continue his jog. 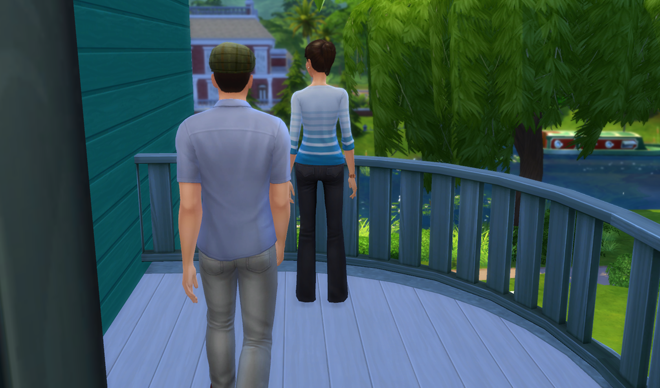 And Mrs. Skinner walked slowly up the stairs and into her new home, her eyes fixed on Malcolm the whole way. It’s like watching Jessica Rabbit leave the room. Malcolm returned home to find his own dangerously beautiful wife waiting up for him. “How’d it go?” Ede asked. “Good. They’re all settled now – just across the street from Easter and Jarrett, actually.” Malcolm said. “Ooh, you’re all knotted up.” Ede dug her thumbs into her husband’s tight shoulder muscles. “Maybe it’s the pregnancy hormones,” Ede offered. “I hope so,” he laughed, relaxing a bit. “I’ll protect your virtue,” she whispered into his ear. “You enjoy this, don’t you,” Malcolm said. “Only this part,” she smiled. Dunno why, but this little family is the most “unit-like” I’ve had yet. The four of them gravitate together like drops of oil in a cup of water. 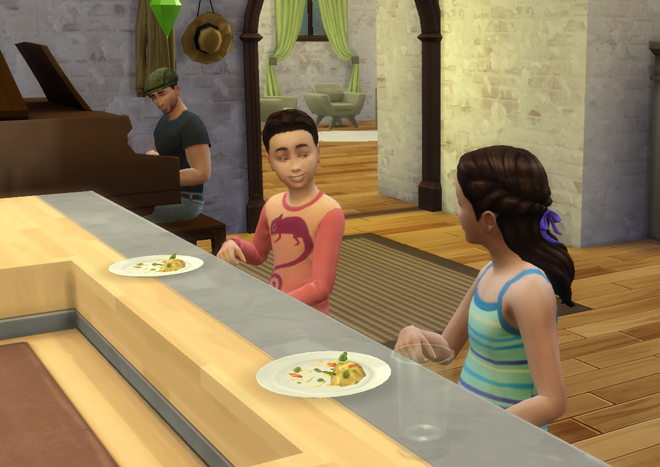 On an average morning, the littles bond over breakfast at the bar to dad’s piano tunes while mom bones up on mixology for work, and it’s the most natural thing in the world. The twins are pals now. Ede still needs to practice her drink making skills a bit, ha. The kidlets’ birthday was fortuitously timed – they only had two school days before the weekend came and liberated them from homework. 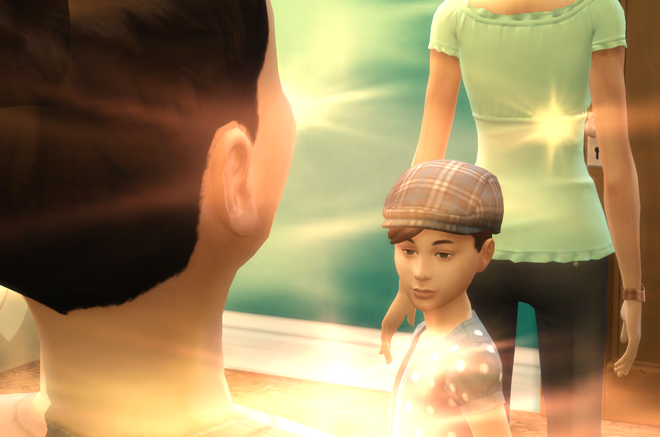 But being the motivated little peanuts they are, they wasted no time in knocking out aspirational milestones. Keyboard commander on one side, chalkboard nails on the other. Stages one and two of both aspirations were completed with ease. Stage 3, for Forsythia, required a jaunt to the park to make it across the monkey bars a few times. Fennel probably would’ve been perfectly content to stay home and doodle, but we felt he would benefit from the fresh air and some time to regain his hearing, so they made the trip together. Forsythia eyes the play structures hungrily. For a Saturday, the park was strangely empty. 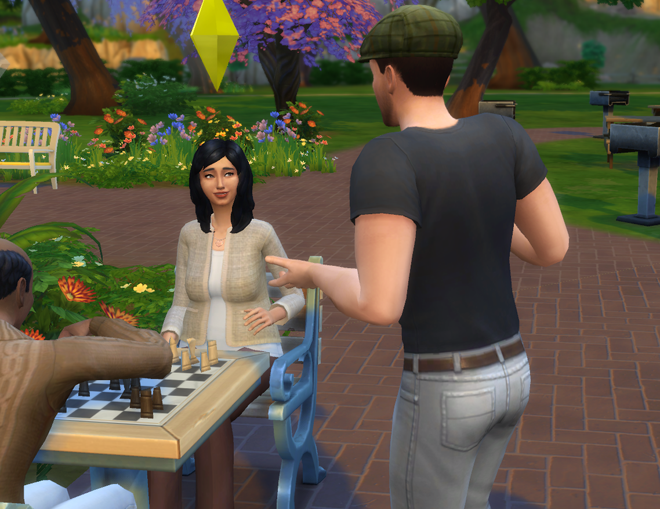 Fennel meandered over to snack on an abandoned hot dog, said hello to a couple old dudes playing chess, got bored and went home. But Forsythia was determined to play for a while, even if it was by herself. She did her obligatory monkey-barring, and then pirated her own ship. She imagined she’d just wrested control of it from a would-be mutineer and his cronies, throwing the disloyal overboard so she could keep all of the booty herself. 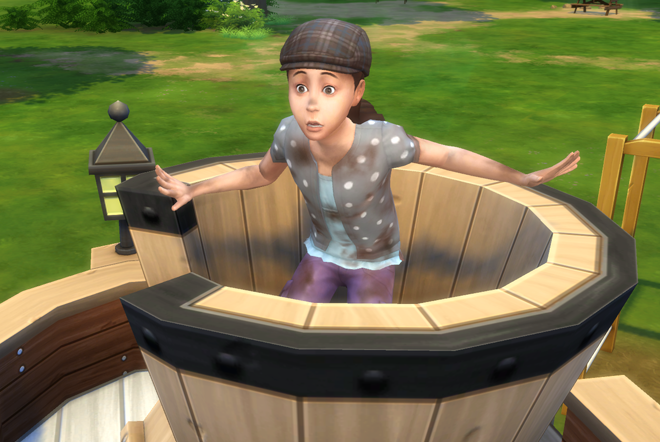 She was feeling top-of-the-worldish until she spied something freaky gurgling just off deck. She’d been so cloaked in her own imagination that having another actual person suddenly appear in her ‘game’ was too much! She booked it outta there — not ’cause she was scared, you know, she just needed to go. Like, now. Meanwhile, back at home, someone had gone back to channeling tormented cats. Maybe it’s just this instrument.. I can’t still be this bad. Forsythia could hear them from the tub, but her mind was still on the sea. 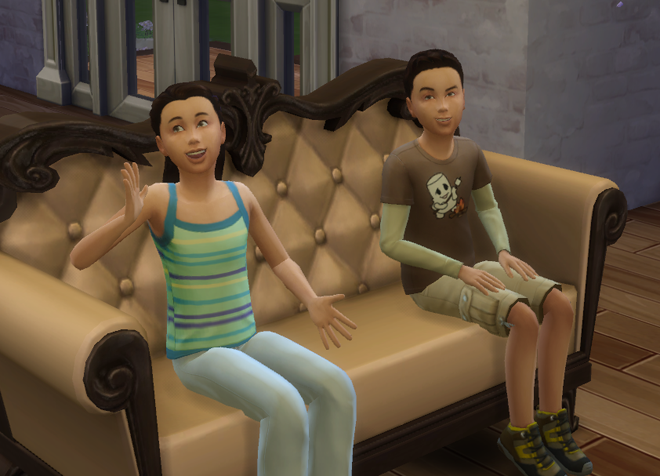 The twins finished the day by sneaking in an action film while their parents snuck some alone time. The next morning at breakfast, the kids had something they wanted to discuss. “Or maybe it is,” said Fennel forebodingly. “Could that actually work?” Fennel asked. He seemed interested too, now. “Can’t hurt to try,” Malcolm said. 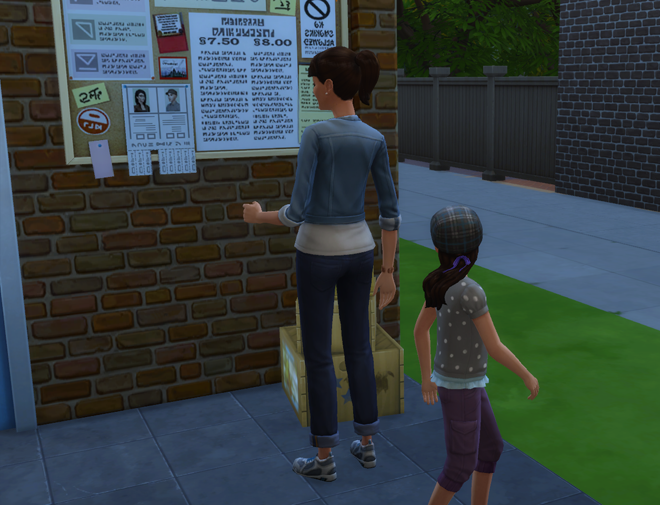 Ede was certainly willing to give it a try, so she sat down after breakfast and began to draft up a little flyer. 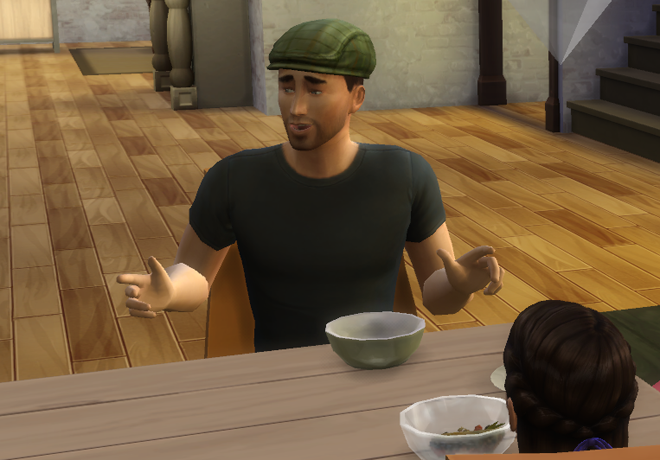 “Can we request some entertainers that can actually play instruments?” asked Fennel. “And some more kids!” added Forsythia. or a Place to Call Home! “Should I do the thing with the little tear-away strips of paper and the phone number?” Ede wondered. “I’ll do both,” she grinned. In addition to posting the flyer online, Ede printed some out and she and Forsythia went and tacked them up around town. “So what do we do now?” Forsythia asked. Life seemed particularly grand for Edelweiss and Malcolm. So much so that they felt like they were getting away with something. They were happier than they’d ever been. 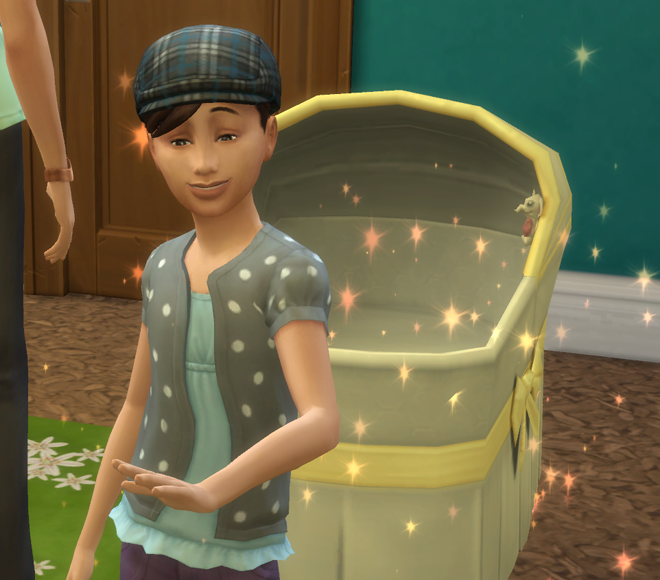 It was a special day – their littles were graduating from the bassinet. 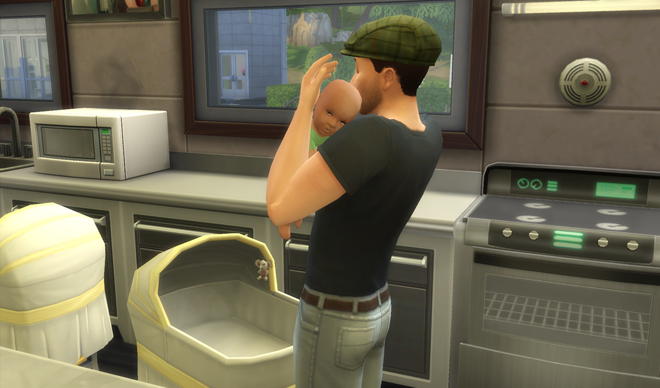 Malcolm finished up the dishes and went up to spend a precious last few moments with baby-them. And then it was time. They each monitored one kid ~ Forsythia began to change first. Edelweiss got so excited, she had to turn away. 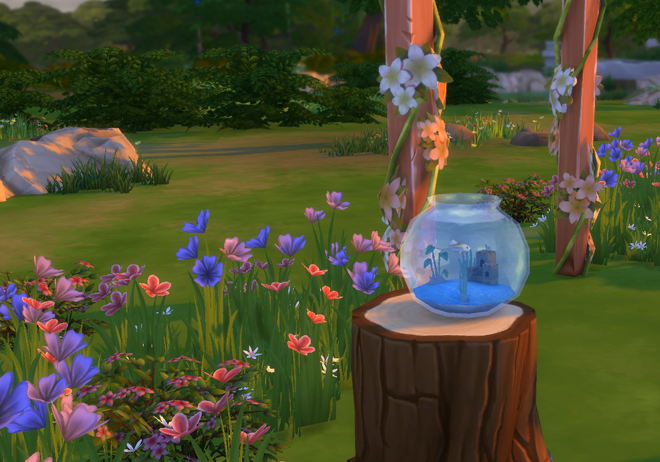 Whatever she looks like, the girl that emerges from that hamster ball will always be beautiful to me. 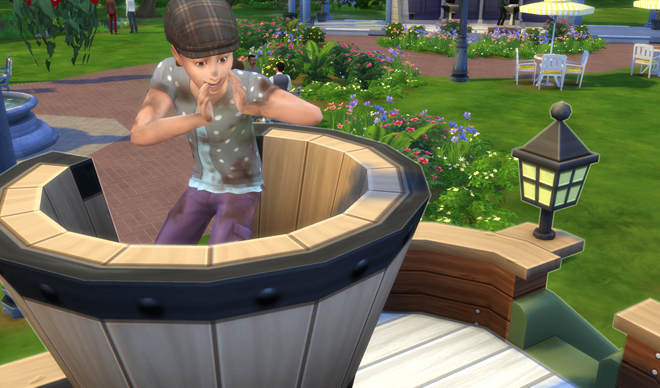 She rolled the Good trait (uht oh – Grandma might not like that) and the Rambunctious Scamp aspiration. 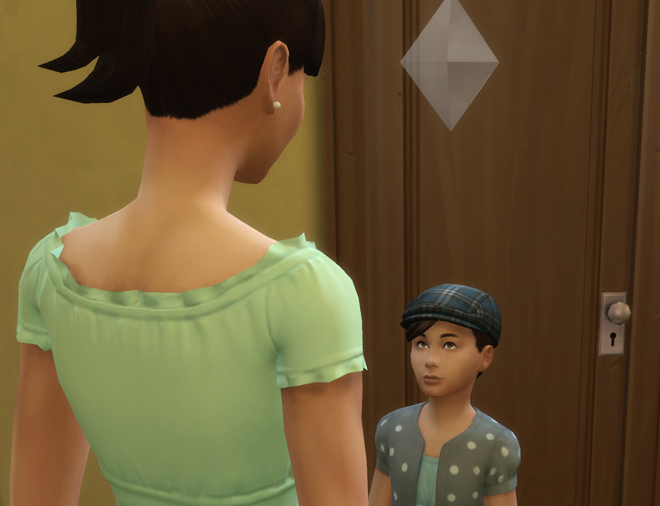 Somehow young Forsythia didn’t get the memo that she was a twin – when her brother started to sparkle, her fantasy of being an only child began to crumble. Wait.. Who the heck is that? 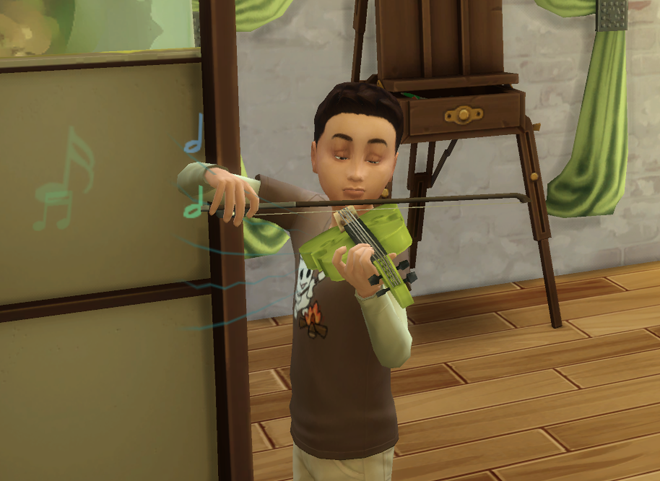 Fennel rolled the Music Lover trait and the Artistic Prodigy aspiration. He didn’t share his sister’s sibling discomfort (I’ll never understand how/why that works), so he didn’t get what the big deal was. 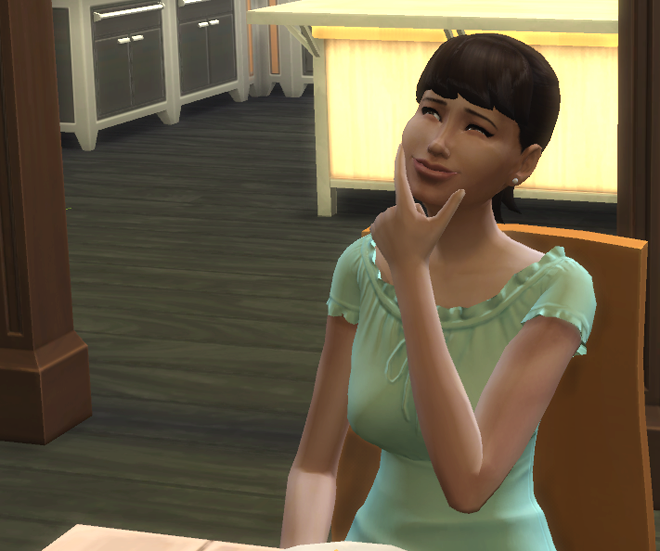 Ede tried to put her daughter’s mind at ease. Someone is not entirely convinced. Forsythia eventually gave up her grump and decided to delay judgment, for now. Fennel, aware that he’d obviously missed something, looked to his pop for guidance. Should I be worried, Dad? Naw. You got this, son. Malcolm and Fennel gave the girls some space & took some time to get to know each other better. 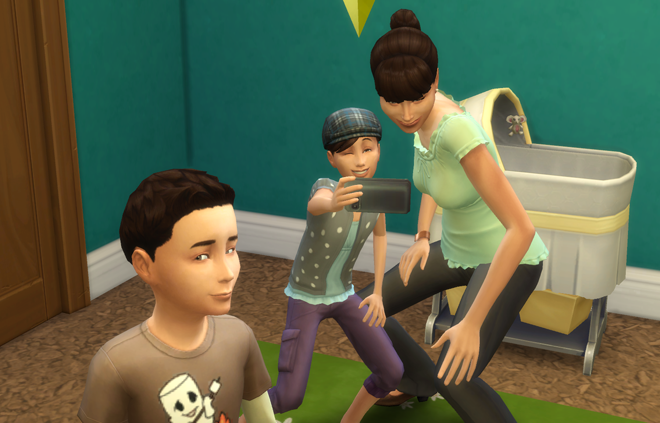 Malcolm was super excited to have a music lover in the family! This was nearly all autonomous, by the way. It was so cute. I thought I might die. But, I didn’t. Whew. The kids were both hungry as heck, so they tactfully freed themselves from the loving attention of their respective parent and returned to their scene of entry: the kitchen. 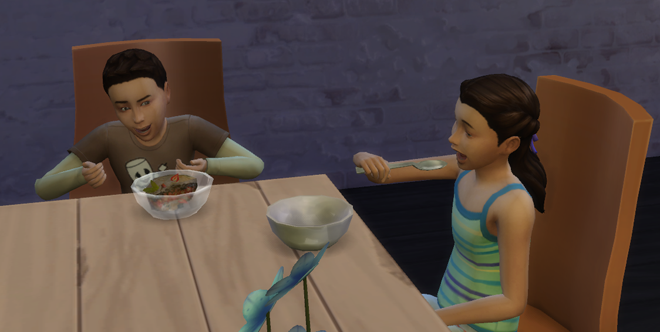 At first they just sat together in silence, but Fennel couldn’t help but crack a joke. Then Forsythia offered a heartfelt compliment. And before long they were sharing huge smiles with their huge slices of cheesecake. 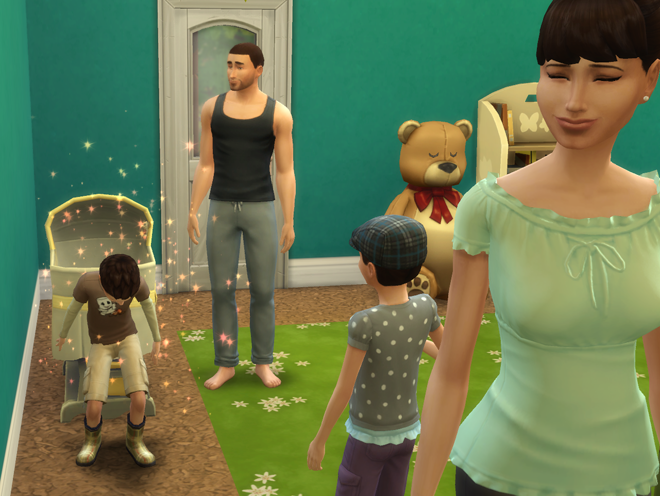 The Wolff family has once again been gifted with twins: A snuggly little boy called Fennel, and a fussy little girl called Forsythia. 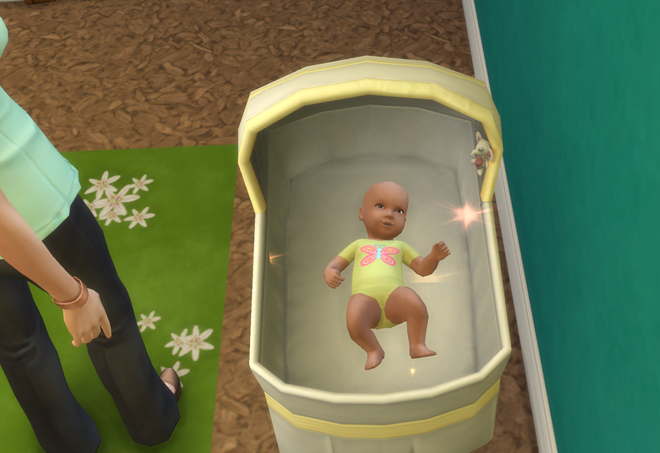 Though we’d managed to get Ede to the hospital in time for the births, for some reason the game plopped the bassinets into the kitchen. 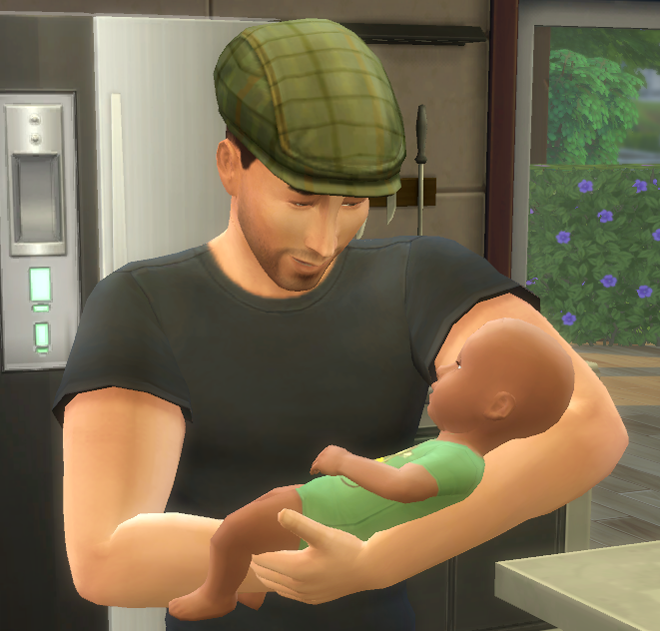 But that didn’t stop the proud papa from doting. Malcolm is amazed at the intact little sleepy human in his arms. Edelweiss is amused that this scowly little beauty may be even grumpier than she was. Malcolm came with 4 in logic, 3 in charisma, piano and cooking, and a bunch of other skills in the 1-2 range. Brown hair, light brown eyes, average/fit build, med/light skintone. He’s a few days younger than Edelweiss. Something about being a mother has bolstered Ede’s self-assuredness and put her back into perpetual confidence mode. 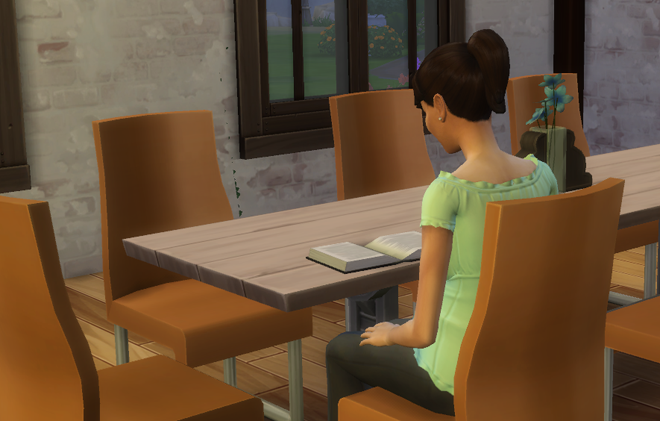 This seems to negate the restrictive aspects of her Loner trait almost entirely. 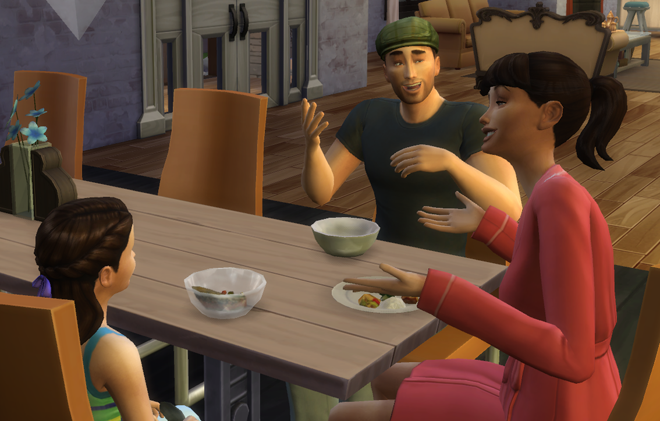 Whether from the priority shift of new parenthood, or the fact that they were both nearing the end of their young adult life stages, both she and her husband Malcolm have had careers on their minds. 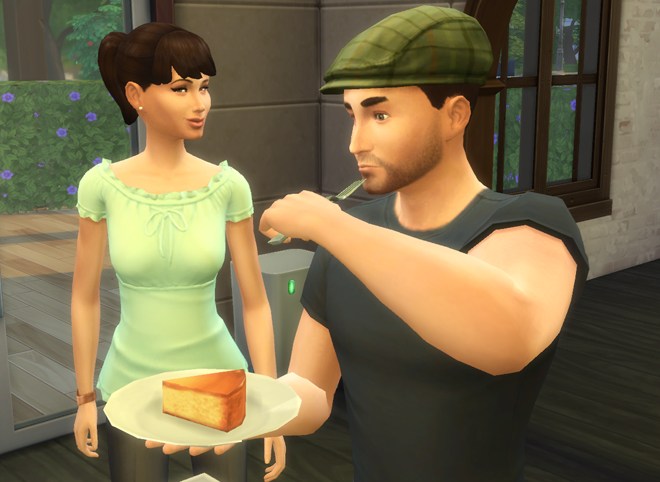 Edelweiss pondered her options while she prepared to try out a new recipe she’d just learned – Sim City Cheesecake. 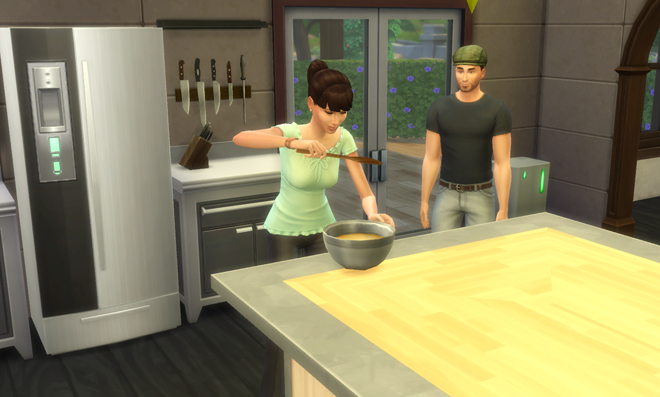 Malcolm came to watch her; they did a lot of their conversing in the kitchen these days. 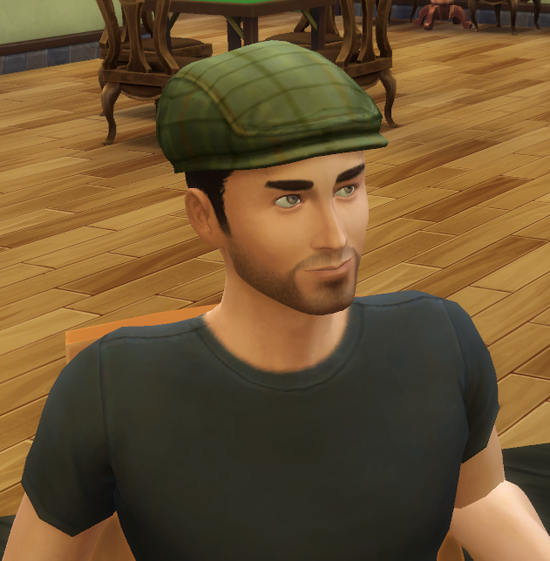 “I suppose I could give that business thing a whirl,” he smiled, distracted. Whatever she was making, it smelled great! Edelweiss poured the batter into the mold and set her cheesecake to bake. “Only if you don’t need me around the house, I mean,” Malcolm added as they waited for the oven timer to go off. Malcolm was happy and did pretty well just handling the estate, but he’d whipped our finances into shape quickly and part of him really yearned for new challenges. 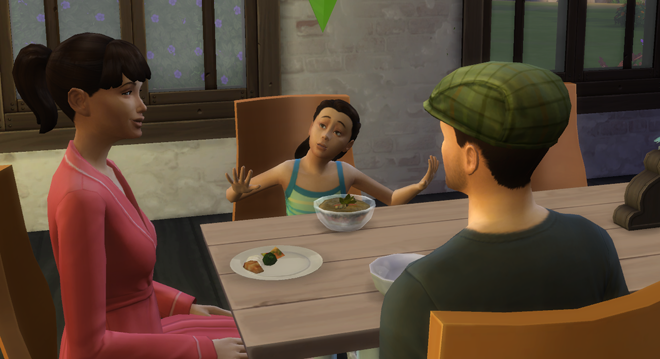 “Well, I hope to be off somewhere myself, too” she said, “and the kids will either be at school or mom will be here.” Ede had already developed her cooking to level 8 on her own, gourmet to 6, and was constantly creating amazing meals. She was curious how much further she could develop her talent if she made it a serious, job kind of thing. Malcolm was happy to oblige. It was a good thing they’d kept the home gym – although Ede seemed to be immune to weight gain, Malcolm was not, and he wasn’t about to give up taste testing! Ede beamed. That’s what she was thinking, too. Like many pregnant gals the world over, Edelweiss Wolff was looking through a book for baby name ideas. But her particular choice of book was, perhaps, a wee bit unorthodox. 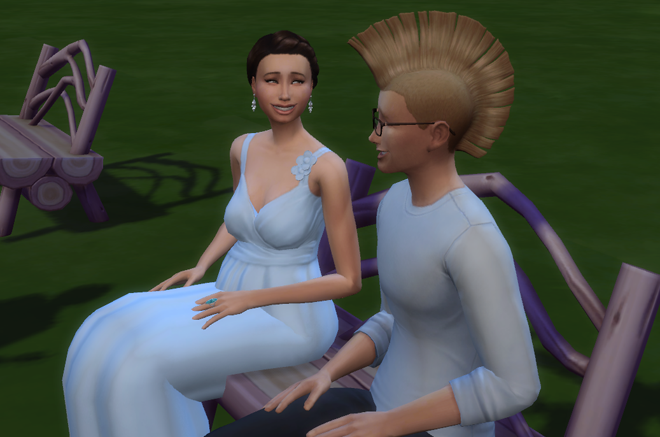 “Got something against drag queens?” Malcolm smirked as he sat down next to her. “Oh right, I forgot about your fascination with my girly clothes,” Ede teased. “Why do I call you Edelweiss?” Malcolm thought for a moment. “Out of respect, I guess,” he shrugged. Ede didn’t catch his meaning, so he continued. Them sound like fightin’ words, partner. “What’s that supposed to mean?” she scowled. 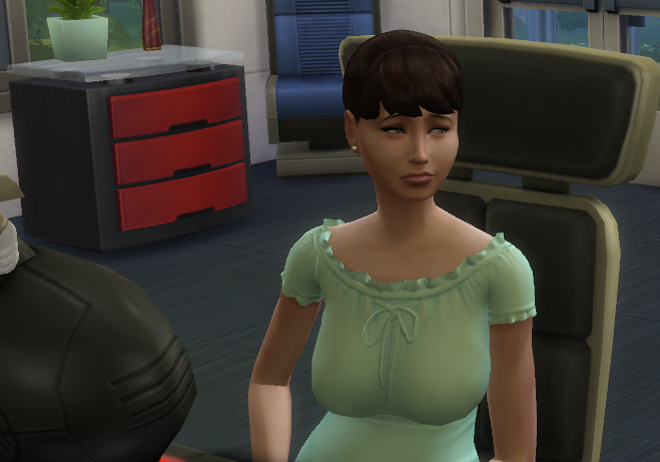 Ede’s scowl turned into a sigh. Great, now he’s making fun of me. Ede chuckled a bit at that. She’d never actually killed anyone. “You’re making me a bit tingly, now.” Ede smiled softly. Ede didn’t say anything. She got up from the table, as did Malcolm. Sweetest man on the planet. Ede decided to attempt to stick with the tradition after all, and went to the lab to peruse the information database for other flower names. 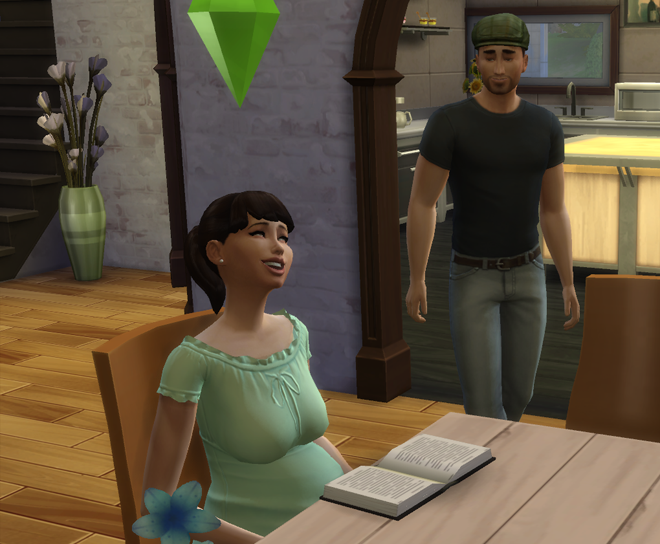 But late-term pregnancy messes with your attention span something awful, and it wasn’t long before she got distracted. It feels so good when the blocks fit together just so! “Oh my god!” Ede proclaimed when she landed in her email after a riveting round of Blikblock. “What is it?” asked Malcolm, who had been downstairs exercising. “Are we going to try to go?” Malcolm asked. 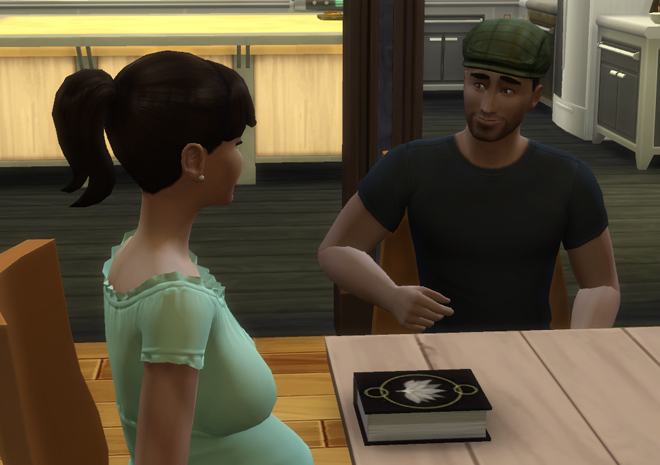 He hoped he’d done an adequate job of masking his wish that she would want to stay home and not stress herself at this point in her pregnancy – they were expecting the baby to come any day now. If Edelweiss wanted to go, though, he’d make that happen for her regardless of his worrying. Edelweiss didn’t answer right away. When she thought of traveling in her current state, she did not feel very safe. Plus, weddings. Ugh. 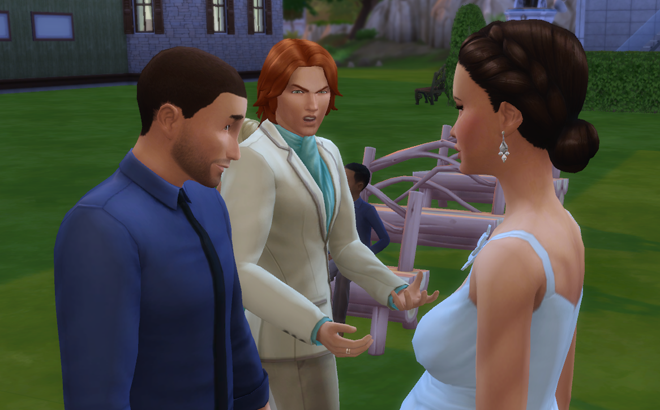 Her own wedding was the only one she’d been to in her entire life (and Legacy brats go to a lot of weddings) that didn’t make her extremely grumpy, and who wants grumpy guests? 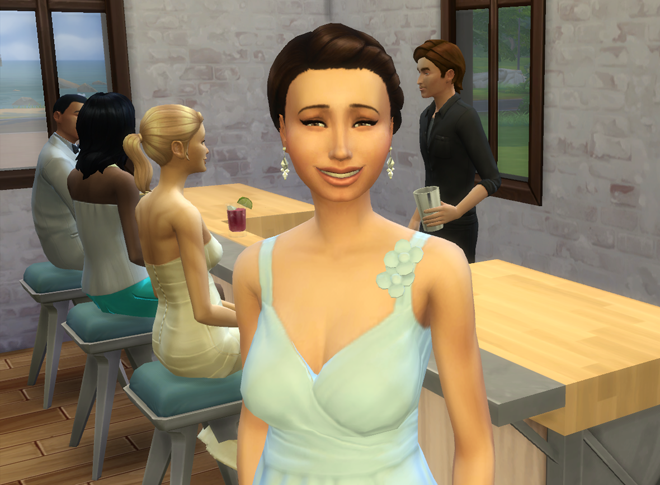 Was she gonna be that jerk who stinkeyes the bride the whole ceremony? The person who stands right by the arch, stomping and glaring? “I don’t know,” she finally said with a sigh. But, she did know of something special that she could do that wouldn’t require her physical presence. 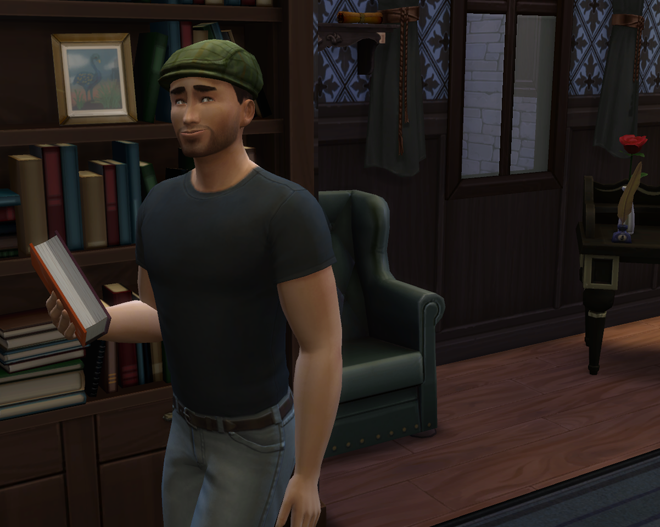 “Can you help me find something?” Ede asked Malcolm. 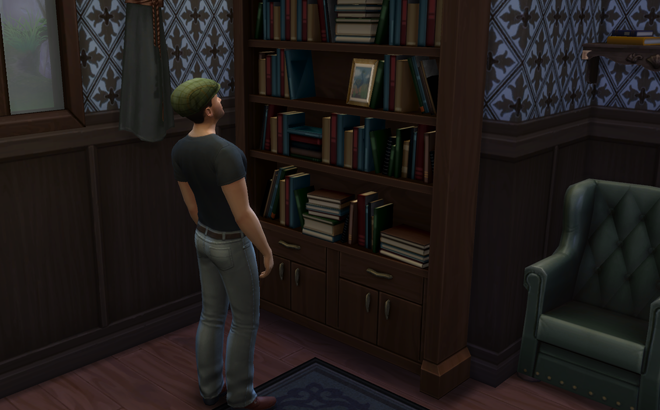 As part of the house remodel, Ede’d had her father’s old bedroom re-envisioned into a study, and most of his literary works were nestled in the shelves. There was a certain book that Dia had written a long time ago, when Elder first gained the Soulmates aspiration. Ede remembered Malcolm commenting on it back when he was helping her sort out the estate, but she couldn’t remember the title. She wanted to make sure that book got to him now. It didn’t take Malcolm long to find it. It was a bittersweet thing, coming across this now, but it was clear from Ede’s face that she’d rested on the sweet part this time. “You’re here to pass this gift along at just the right moment,” Malcolm smiled, pulling her into a hug. He held her gently, adjusting his body so that it cradled her full belly. 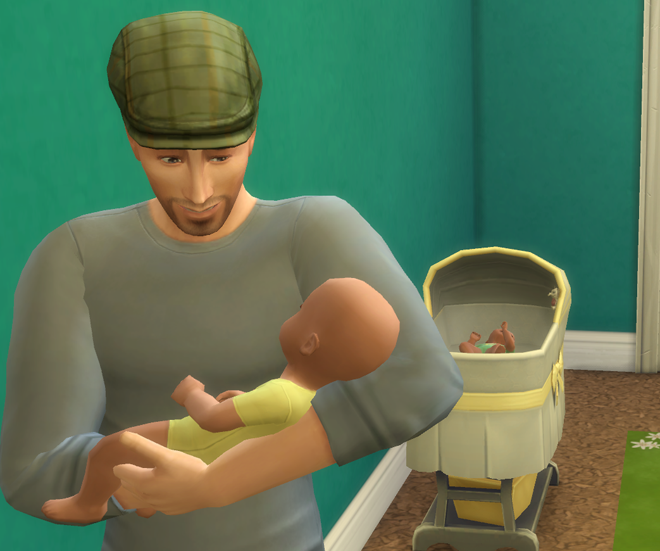 His embraces now included both her and the baby intentionally; it was comforting and sweet. 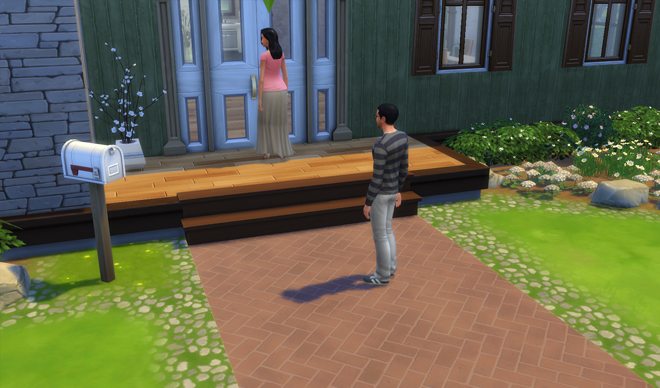 Ede really just wanted to stay home with Malcolm and make a warm safe space for their baby. 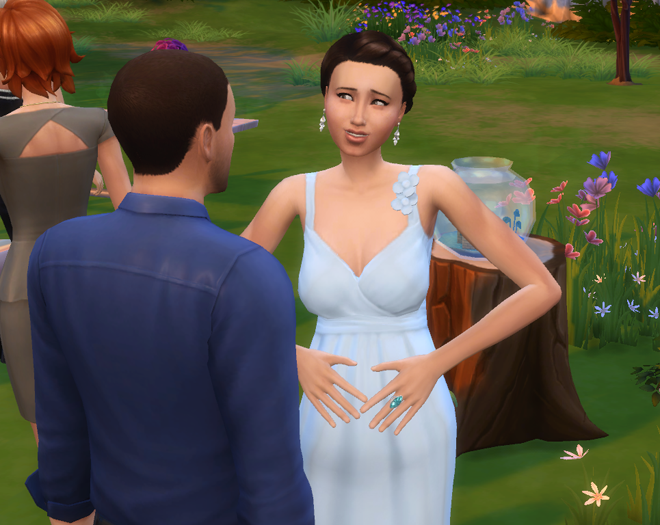 She was happy for her brother, and loved him more than almost anything, but she was a Loner, and she was pregnant, for plumsakes — and that last part was serious stuff. I truly do not want to go to this thing. I’m so glad you said that. “Of course he will,” said Malcolm, quite relieved. 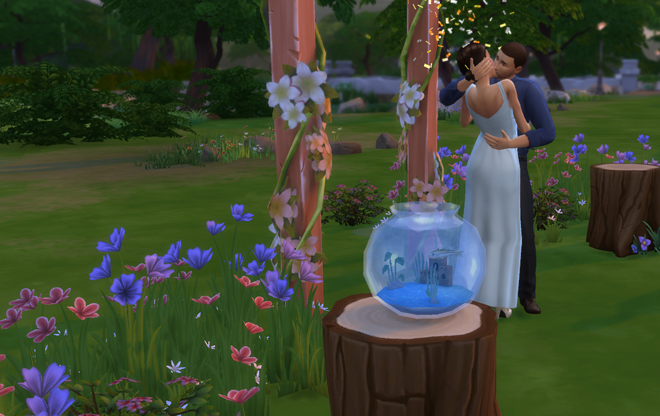 With the pending arrival of generation six, we felt a sudden need to rush the rebuild so that we could throw a wedding ASAP. 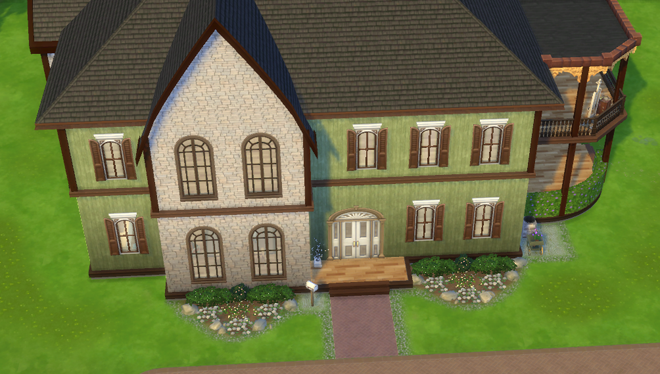 So after much staring and drooling-on-self, the homestead has an exterior! The interior still needs work. *laugh* For some reason I keep wanting to use items that aren’t from the same “set” and so have just-different-enough colors to not look that swell when you put them together. And then, when I go to color the walls, there is much humbuggery. 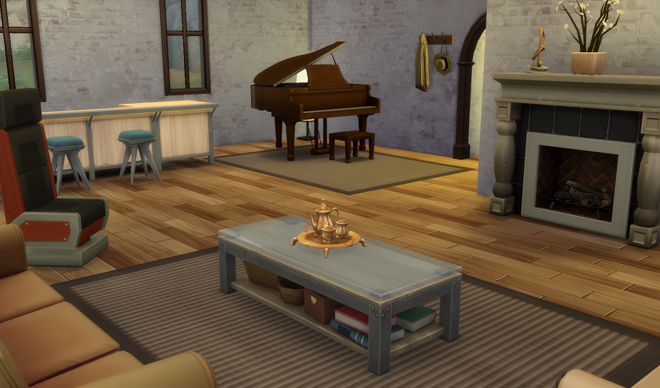 So for now there’s just naked brick everywhere and the furniture needs color tuning. I’ll get there, though, dangit! It’s a much more functional space, at least. The house is quite large still, but the overall footprint is way down. Previously almost all ground space on the entire lot was taken up. Now we have plenty of room to put in trees and other naturey things. 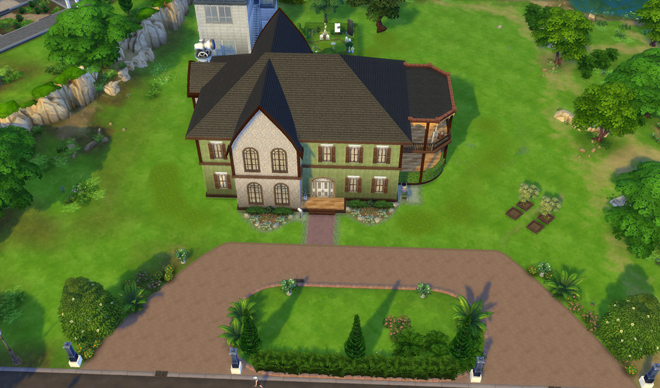 Front lot view, ready for landscaping (only barely started that part). Back view. Look at all that empty space, yay! 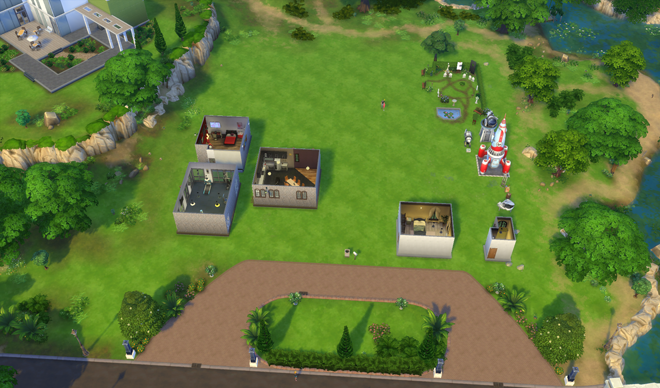 I put all the sciencey bits in a laboratory/gym in the back corner of the lot. We’ve got nearly every Secret Agent item in there, most Astronaut thingies, some aliens. You know, sciencey stuff. 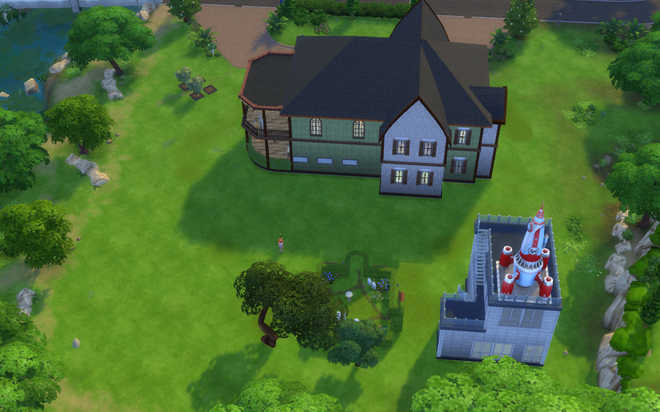 Moved the graveyard over, though I may redesign it to be more organic-looking once I do the landscaping. Managed to shave about 8000 off the bills doing this already! We’re down to a sweet 9972, and that’s before going through and liquidating the collections. BOOYEAH. Thank you for the inspiration, Malcolm! But anyway. 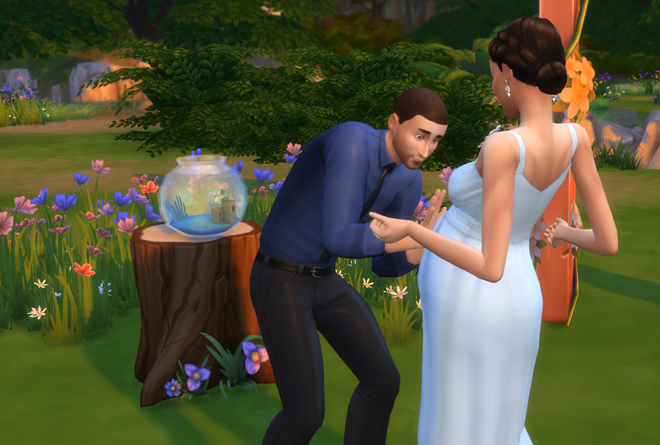 Let’s get on with that wedding, shall we? 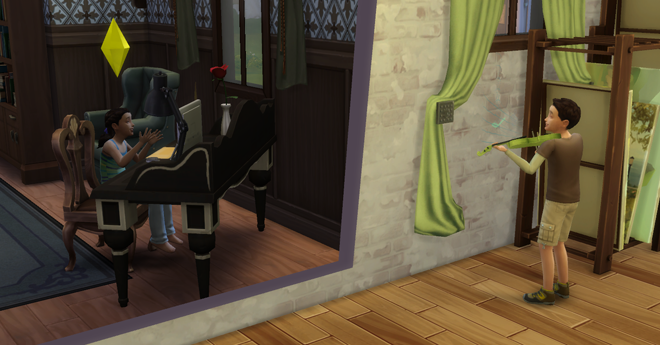 On the day of Edelweiss and Malcolm’s nuptials, Ede decided that she’d go DIY style as much as possible. For her wedding attire, she chose a very simple gown in light blue with tiny flowers at the shoulder. 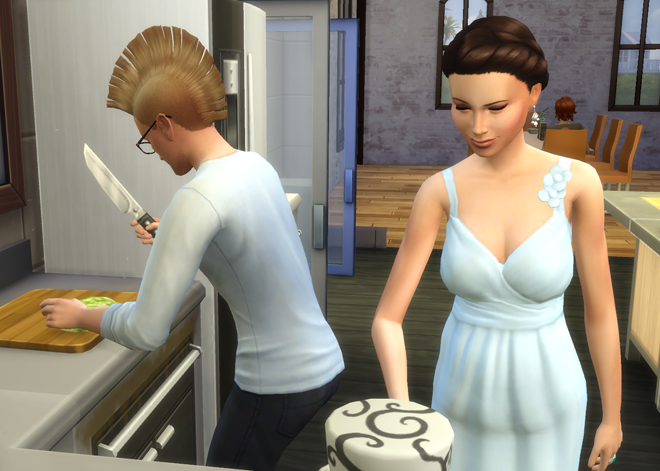 She set about baking her cake in said gown, without an apron! What a rebel. 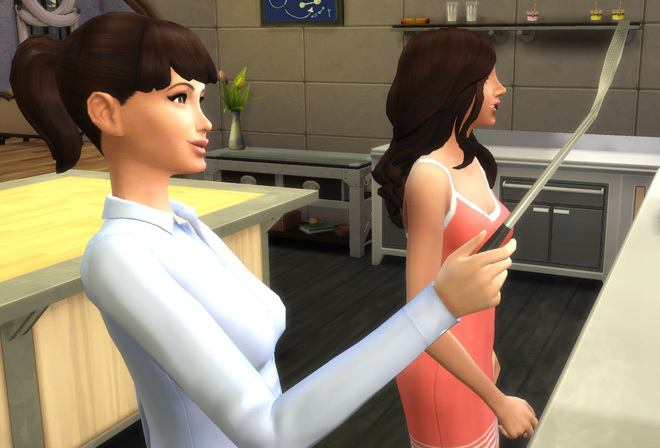 She was stirring along minding her own business when a familiar, familial head of hair strutted on by. 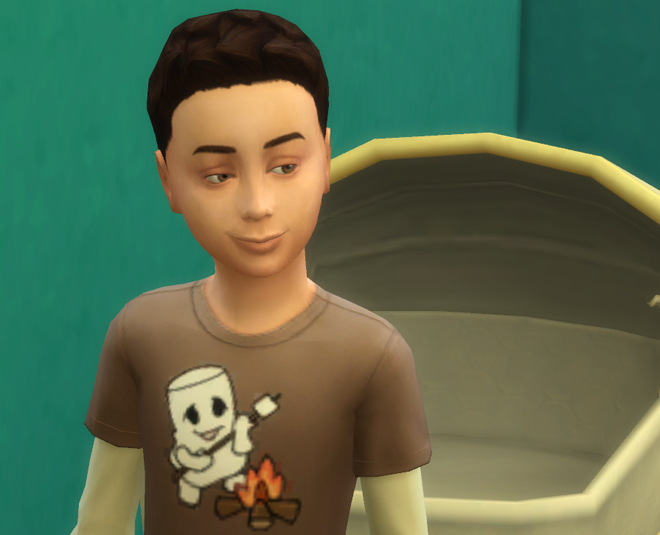 Li’l brother displays his mastery of the loving smirk. Ede nearly dropped her batter. “Describe him to me,” Elder said, expecting body measurements – perhaps a flowery description of his flowing hair, or some personality quirk she found stimulating. Elder could swear she was actually blushing. He was beyond touched by this, and didn’t want to spoil it by making fun. 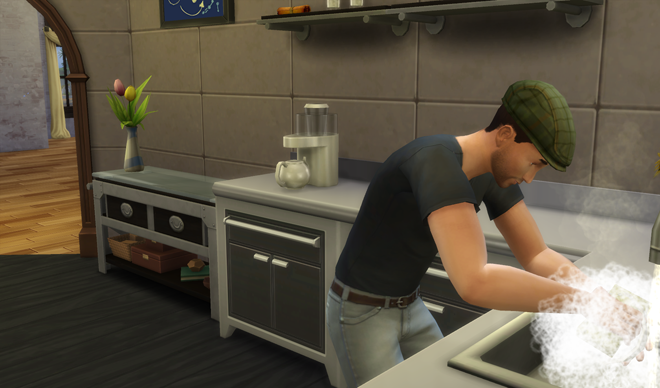 Instead he pushed up his sleeves, ready to help with food prep. Elder got right to work. “Warm and gooey, just like your heart,” Elder teased. With her two favorite fellas around, Edelweiss was on cloud 9. I can say with confidence that it was probably the happiest day of her life so far. Yeah, there were tons of people and it was the corniest thing ever, but she didn’t mind at all. While the dearly beloved loosened up a bit, we finished assembling an impromptu little wedding space in a flowery back corner of the lot. It looked quite nice, the bride thought. Ede just had to position the last guest, and then she and Malcolm had a chance to chat a little while they waited for the others to congregate at the scene. 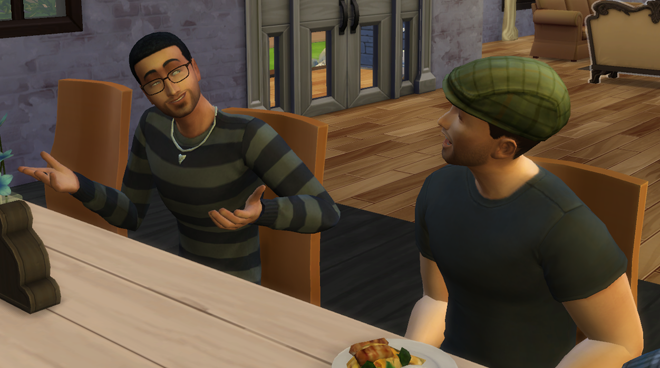 “Isn’t it bad luck for us to meet like this?” Malcolm teased. Luck’s got nothing on us, baby. 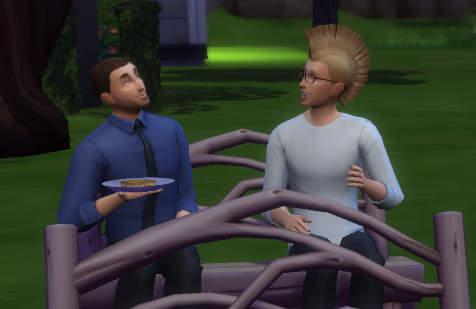 Suddenly Malcolm noticed the special guest. The minnow they caught the first time they fished together has become Ede’s treasured pet. “You dragged the fish out here?” Malcolm beamed. 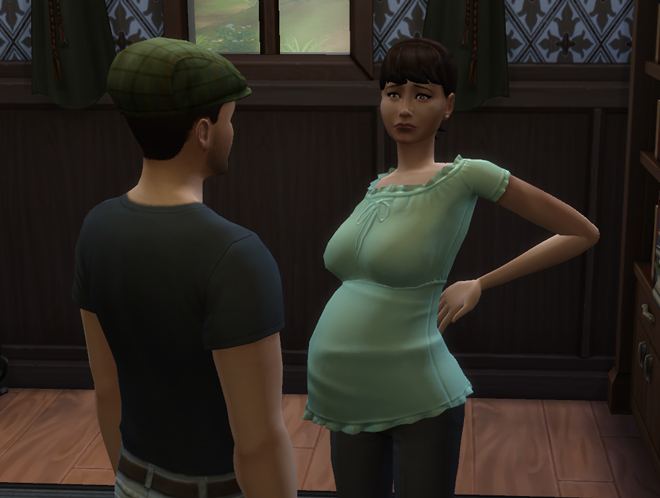 “I was aiming for ‘gently carried,’ or as close to that as a super-pregnant waddle will allow, anyway.” Ede smiled. Ede’s fondness for that fish is Malcolm’s Achilles heel. “I love you,” he said with urgency. Edelweiss had been experiencing an additional level of discomfort for the last couple hours and was afraid that the baby might be anxious to attend the wedding, so they made their way to the arch and began the ceremony post haste. Some kid, Joel, was cracking a scowl in the corner of the camera’s eye the whole time. Dunno why. 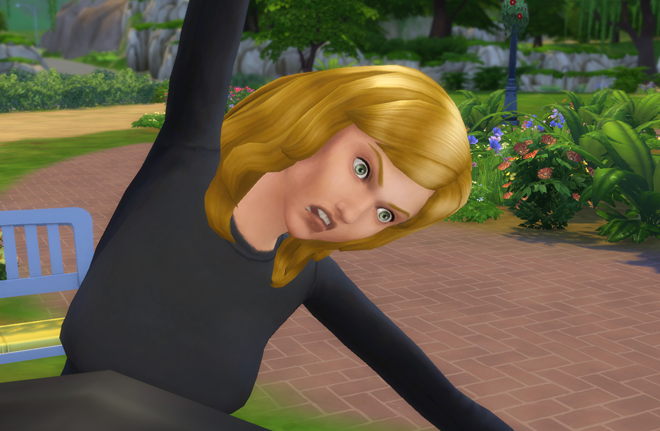 But it was funny, because Ede often went around like that at parties when she was young. Poor Cooper just couldn’t contain her emotions, nor her dire need for a shower. Flarn is just happy he finally has an excuse to wear his cool bowtie. I’m the only one who noticed those folks, though. Edelweiss and Malcolm only saw each other. Ede improv’d her own vows. “My heart is yours, for as long as you’ll have it,” she promised. 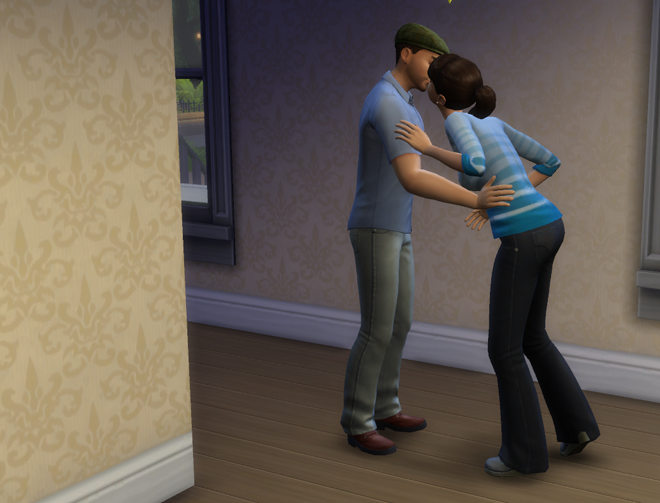 And they kissed, for the billionth time. And it was fabulous. After the ceremony, Elder took time to prod Malcolm a bit. Partly because it’s the protective-brotherly thing to do, but mostly because he was curious at what force of nature it took to break through his sister’s self-imposed isolation. “And what’s that?” Malcolm smirked. “And I wouldn’t dream of trying,” said Malcolm sincerely. The two chatted for a good long while. They got along famously. 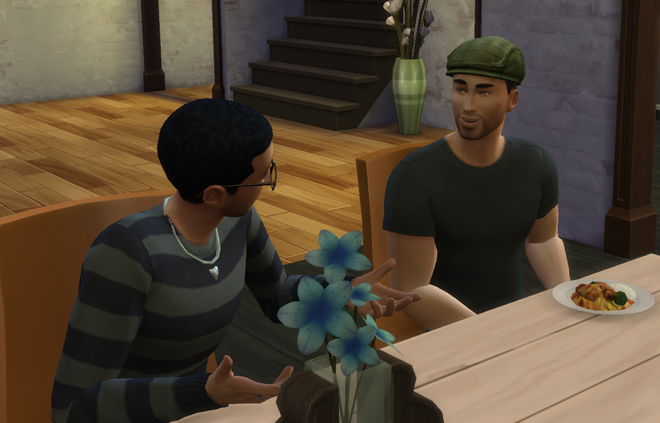 Elder was a bit easier to talk to than Jarrett, so Malcolm was really enjoying the interaction for a change. But he was also anxious to wrap up so he could spend some alone time with his bride, and wanted to make sure they got to catch up first. 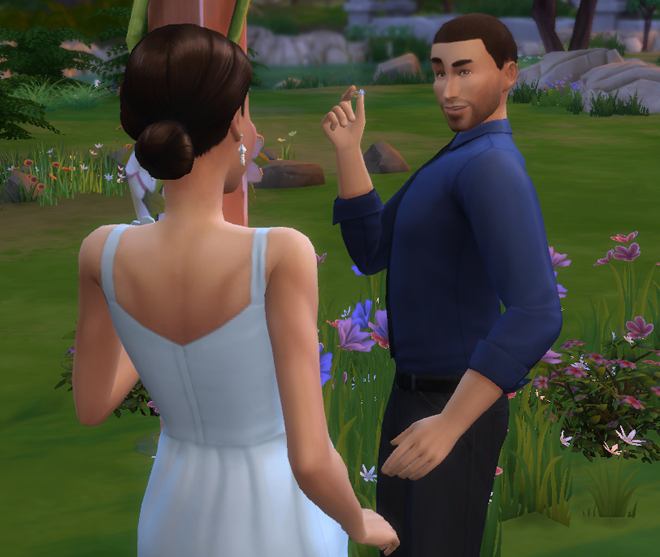 “I’d better let the bride get some face time in,” Malcolm said, excusing himself with a wink. Edelweiss sat down beside her brother. Her belly had calmed down finally, thank goodness. It sure was nice to see Elder again. But Ede sensed that he still had some traveling to do. He just smiled and shrugged his shoulders. Yup, that sounded like a soulmates thing. Ede was ok with that stuff today. Why the heck not? 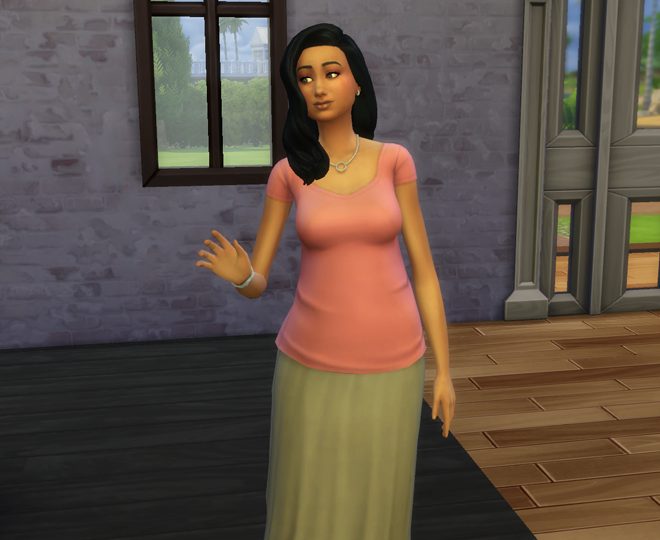 To get away from the racket, Edelweiss had grabbed her fiance and gone over to see her sister Easter Lily and her family. It was about time for her niece Amina to emerge from the cradle and Ede was hoping to catch it. The powers that be permitted us to age up the wee one ourselves on the visit – neat! The legacy of shrink-eye persists in the sparelings. Poor Amina has inherited her pop’s teeny weeny eyeballs. 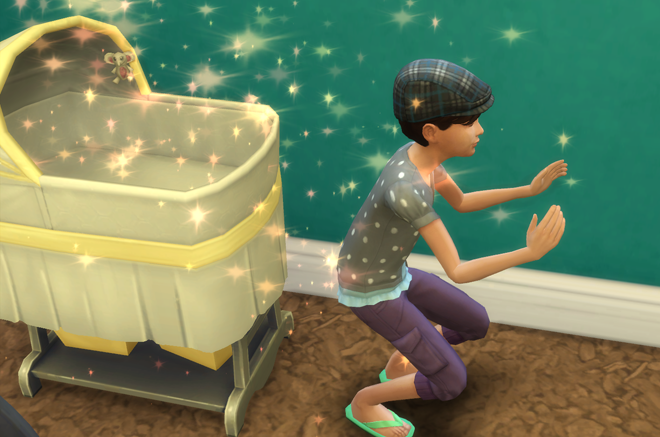 Hopefully she’ll inherit mom’s marvelous bum to even it out a bit. 😀 We still have no idea what her traits are — she’s not been very forthcoming about that in conversation. 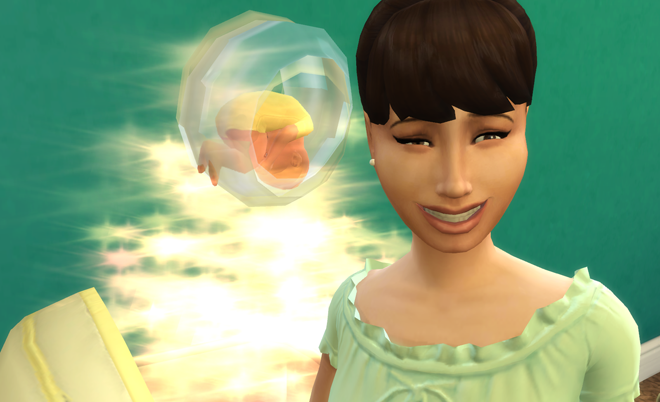 But she’s a very animated child, and she loves her auntie Ede! But, back to the house! Ede had been feeling off for days now, and although she could attribute most of it to stress and lack of sleep, there was something different on this particular day. Her senses were on overdrive. “Damn, you smell good,” Ede told Malcolm. “Well you always smell good,” Ede admitted, “But today you’re like extra good. What is that other smell, though?” she asked with a crinkle of the nose. Malcolm shrugged. Easter kept a very clean house, and he honestly didn’t smell anything. So Ede went wandering around the house, following her nose. “Is that you, frog?” she asked the twins’ pet while Jarrett attempted to regale Malcolm with tales of valor at the horseshoe pit. There was a glittery epiphany at the frog tank, and suddenly Edelweiss knew precisely what her problem was. Though she knew it would do nothing to aid this particular dilemma, her impulse was to run and hide; she did the best she could in that regard, scooting over to the balcony to think. It didn’t take Malcolm long to find her. “We have a problem,” she stated, her back turned. “Will you share it with me?” he asked. Ede nervously turned to face him then, and Malcolm saw in full what she’d been attempting to hide. Hard to disguise a baby bump when you’re such a skinny little thing, no matter how fierce you may be. Malcolm felt a surge of warmth in his chest that was definitely not a heart attack.. Fascination? Joy? Pride? But, that would have to wait, as she was worried about something. Are we not happy about this? “How is this a problem?” he asked gently. “You’re not mad?” she worried. Malcolm slid his arms around Edelweiss and pulled her close, feeling the little firm rise in her belly as her body pressed tight against his. There was a future being dreamed in there; a measure of the infinite had been drawn from each of them to become something entirely new. “I finally feel like I got close enough,” she said softly, pulling away from his embrace. “Close enough to what, auntie?” asked a small voice to her right. “Close enough to check ears for butterflies!” Malcolm joked as he pecked Ede on the cheek. 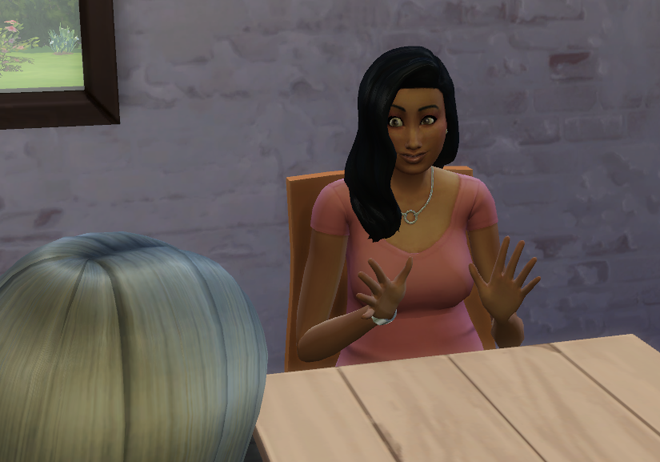 Amina stared in amazement, not sure whether to believe her auntie’s funny friend or not. 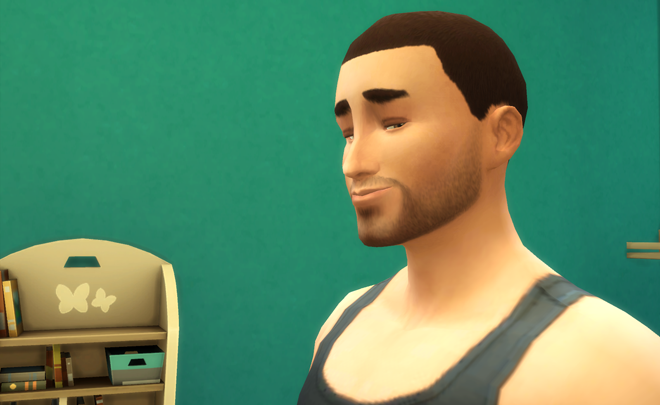 Ede and Malcom shared a bashful, excited smile. 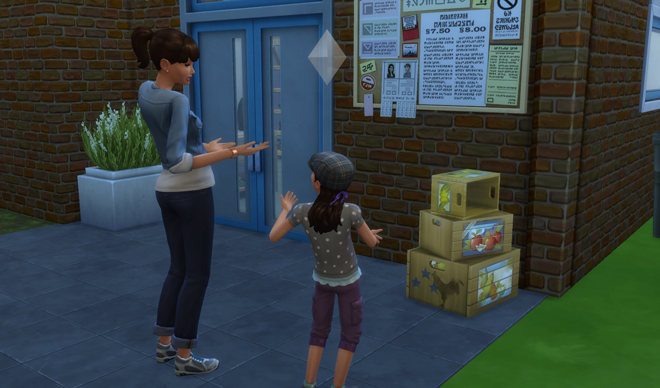 Interruptions by small voices were something they’d need to get used to now.